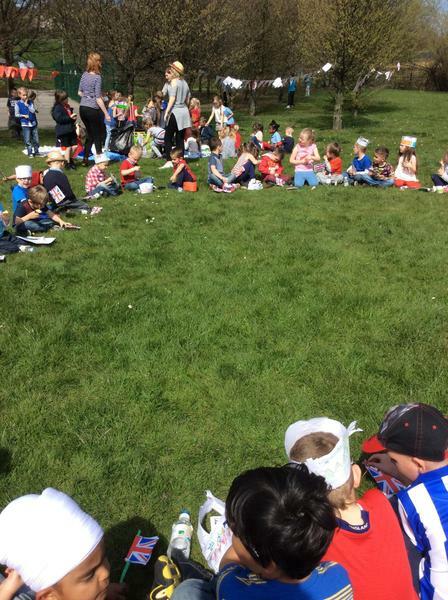 Thank you to all the parents who came with us and supported our visit to Cannon Hall Farm. 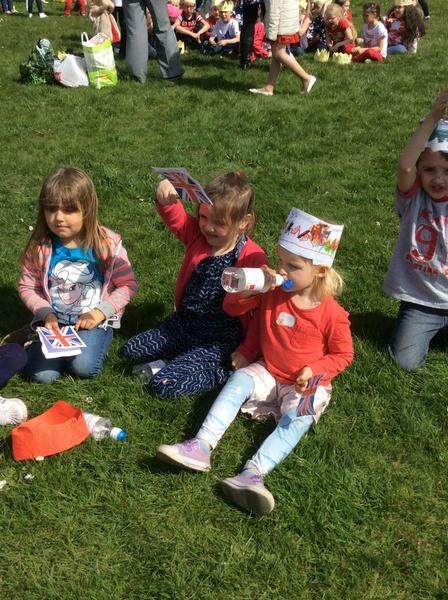 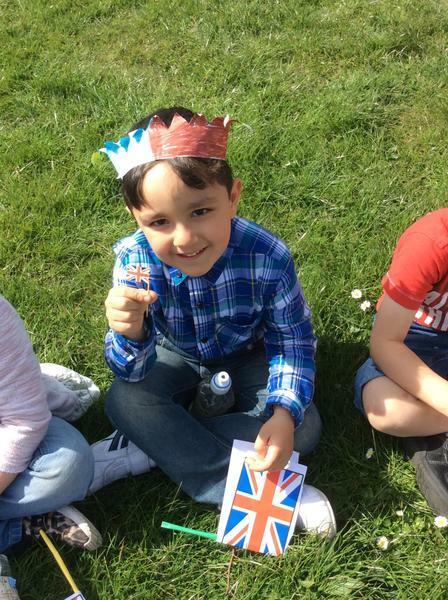 We had some great feedback to how much all the parents and children had enjoyed the trip and what a fun filled day it was. 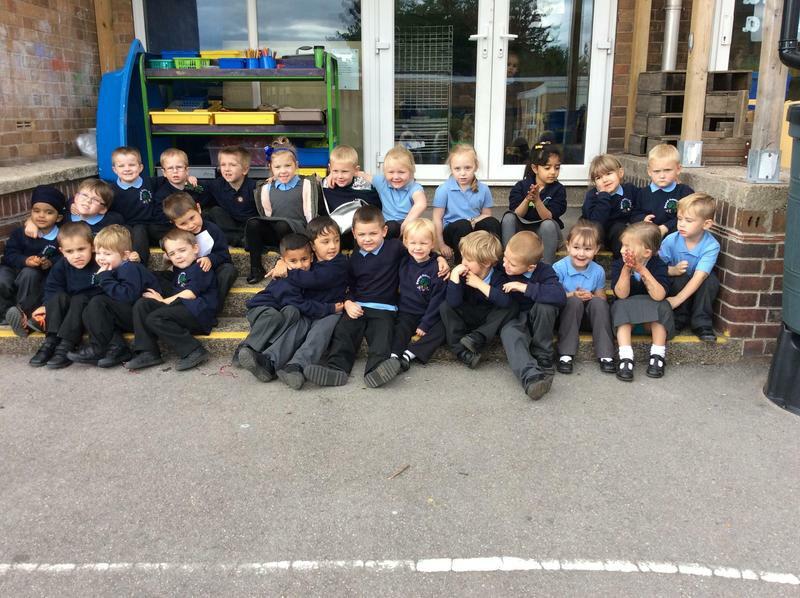 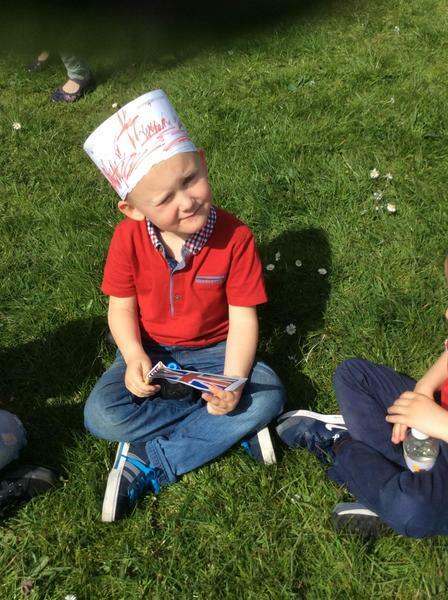 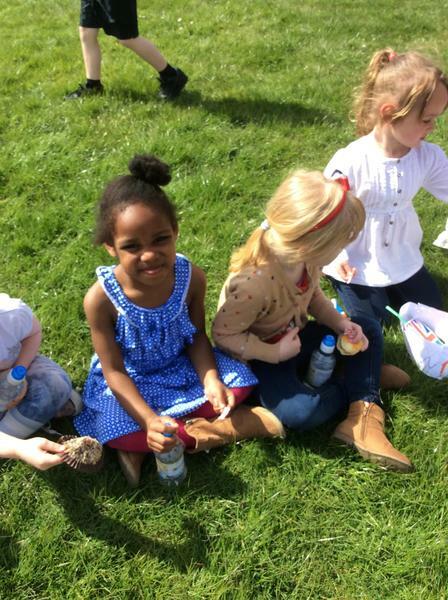 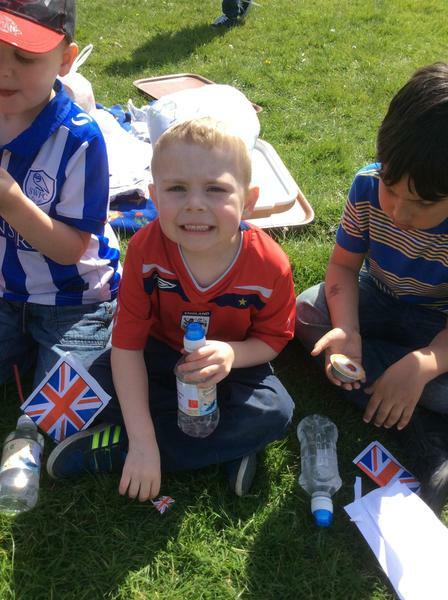 FS2 had so much fun at Cannon Hall farm on Wednesday. 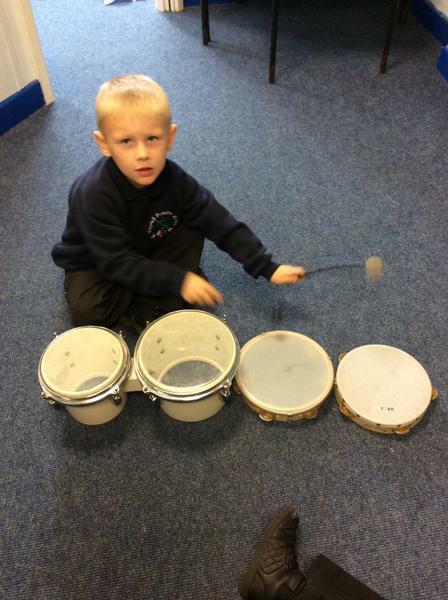 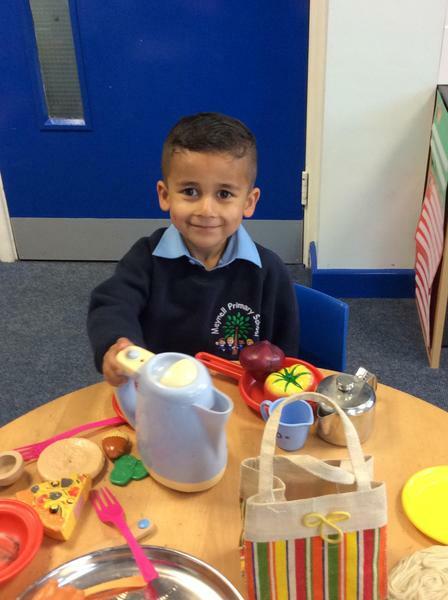 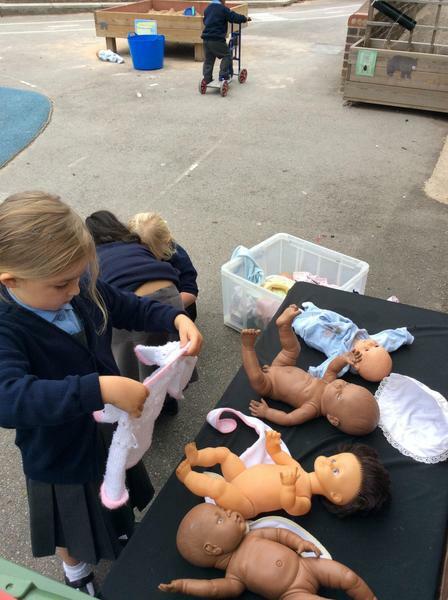 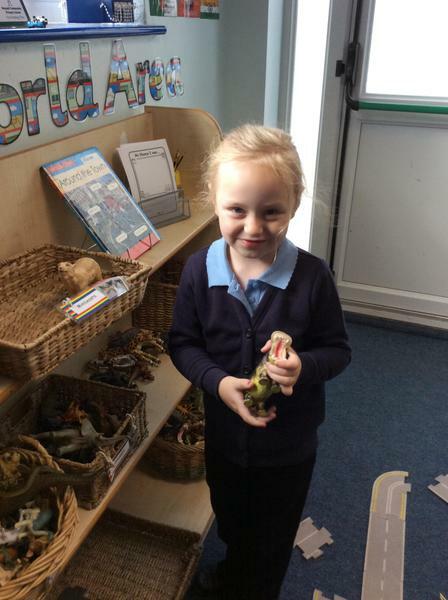 They learnt all about different animals and their babies. 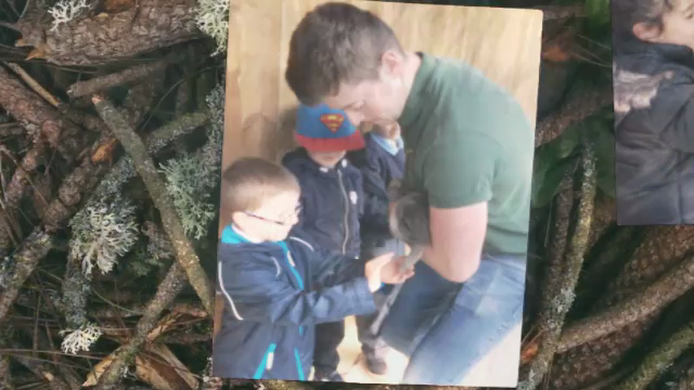 They even saw some piglets and a 2 week old calf. 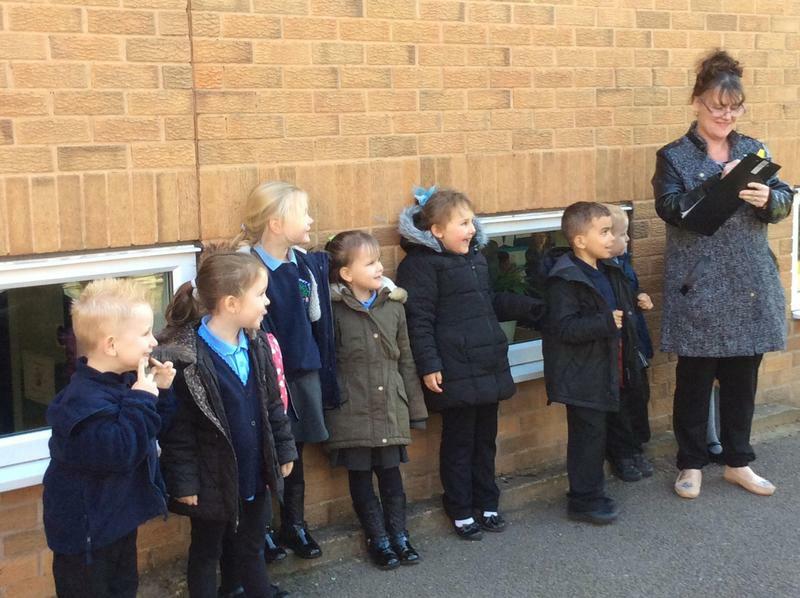 They enjoyed stroking Flossy the rabbit and Caramel the guinea pig. 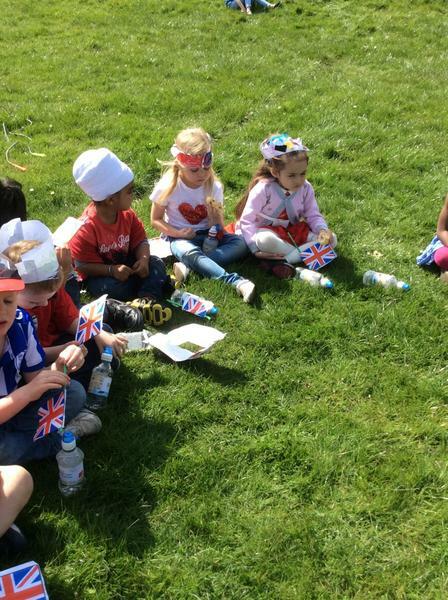 It was their first school trip and all the children behaved impeccably. 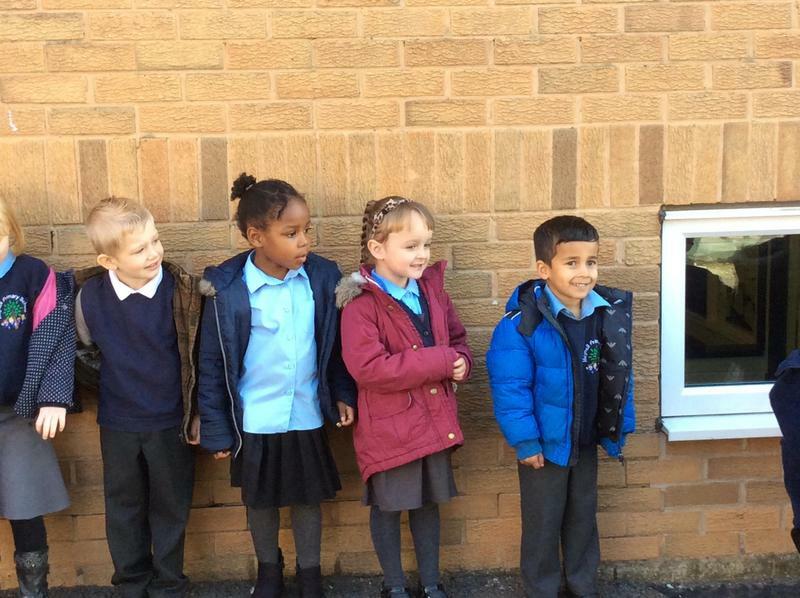 They were an asset to the school! 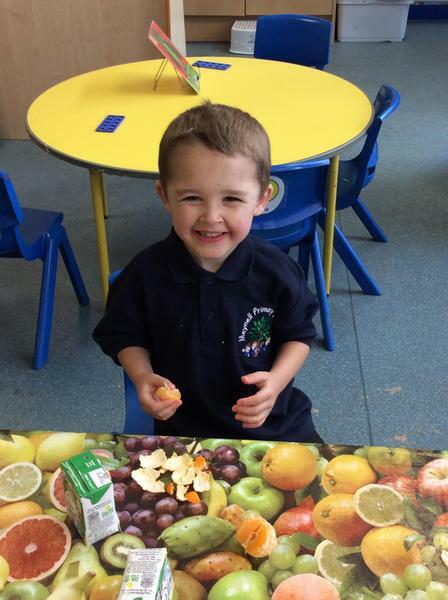 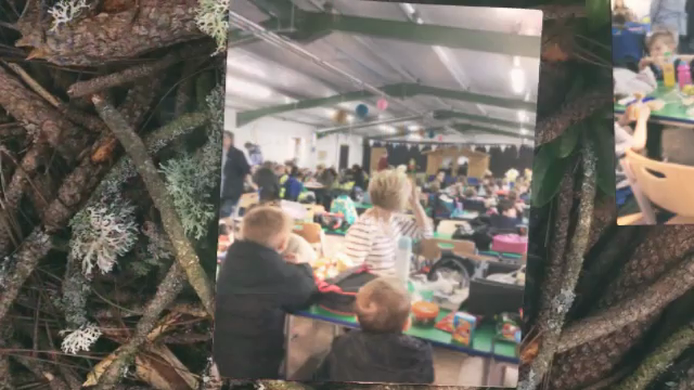 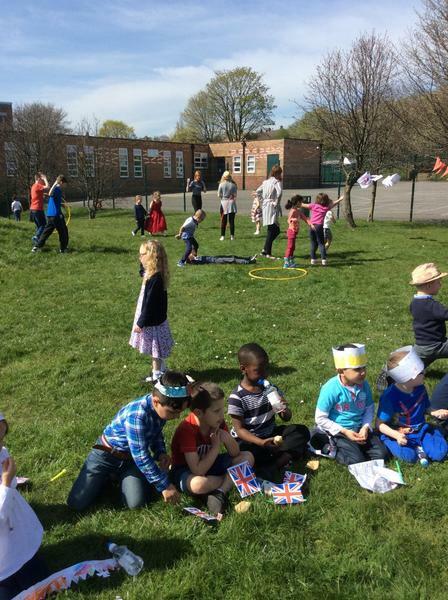 Check out our Cannon Hall Farm animoto video. 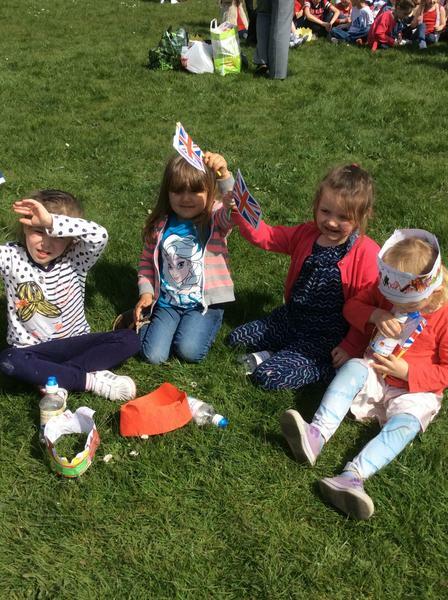 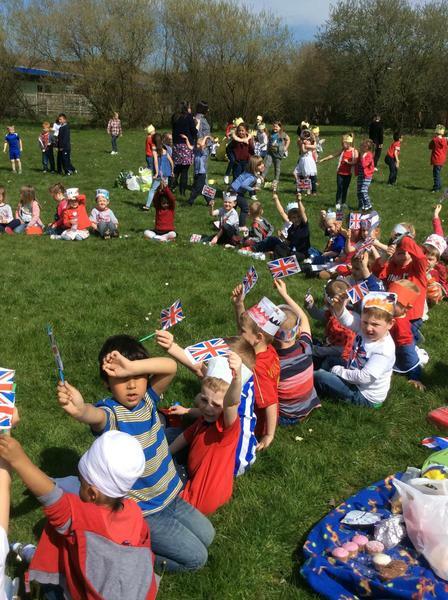 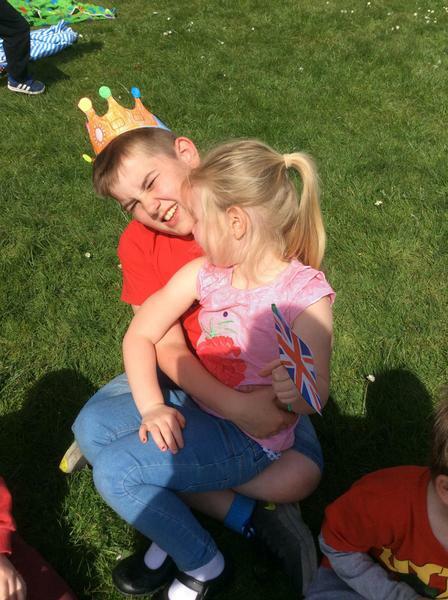 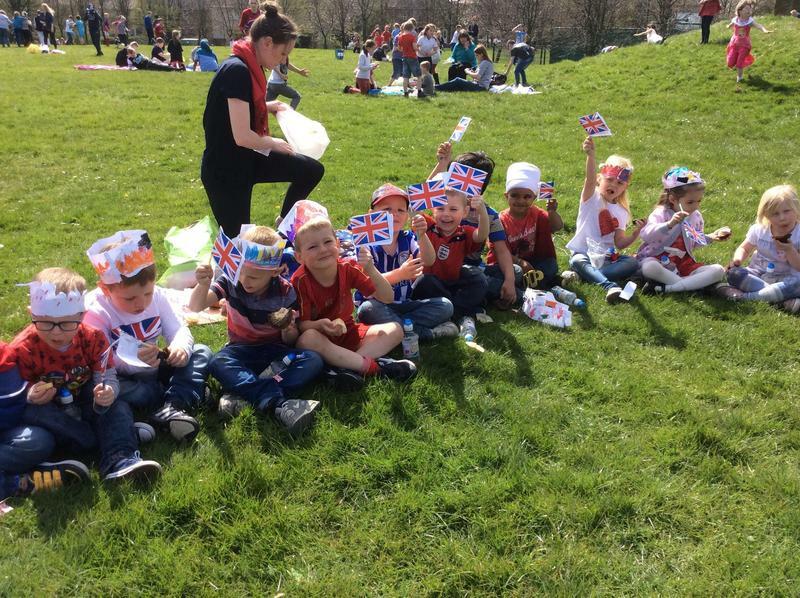 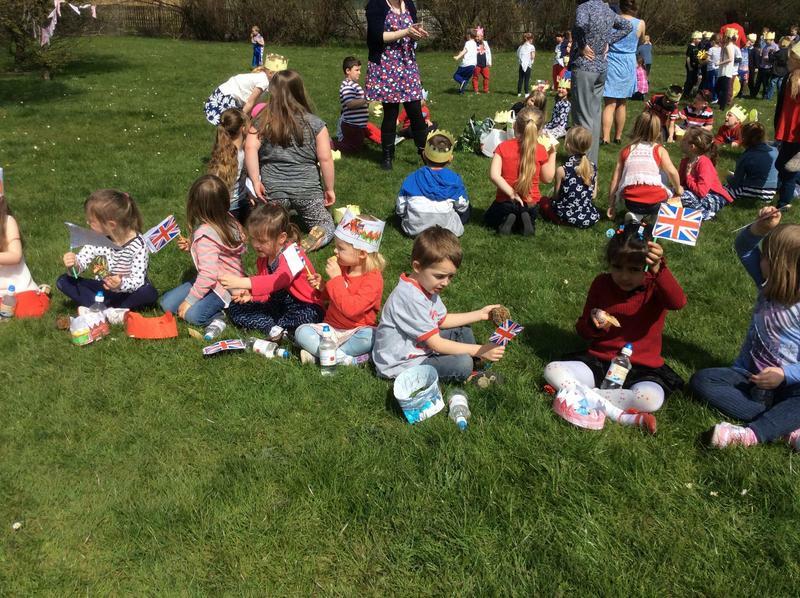 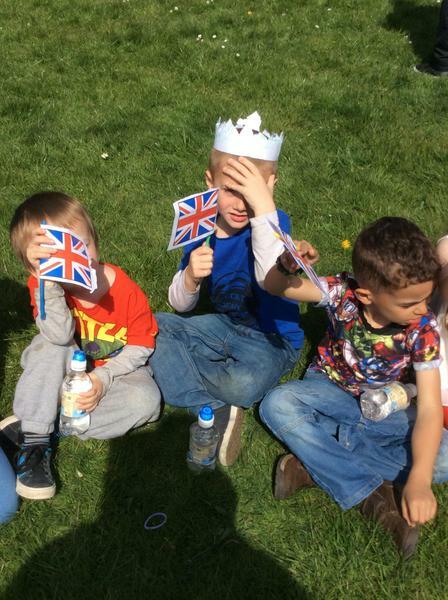 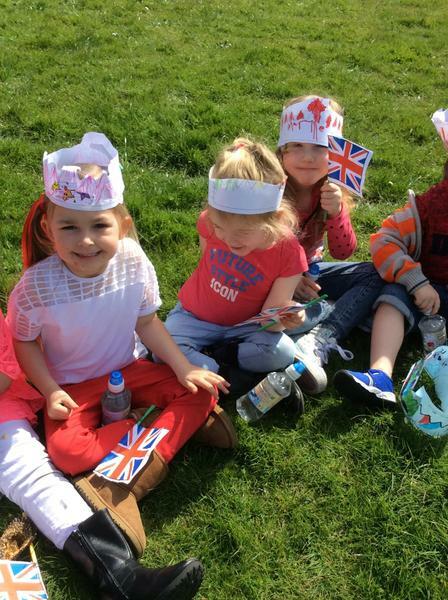 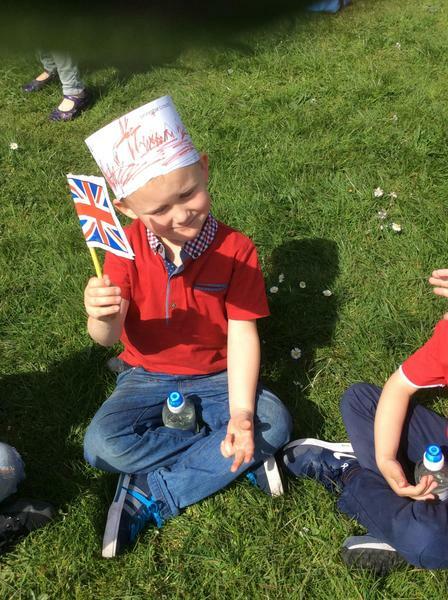 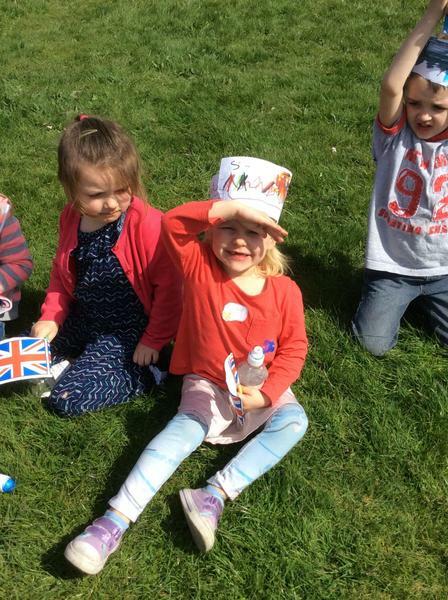 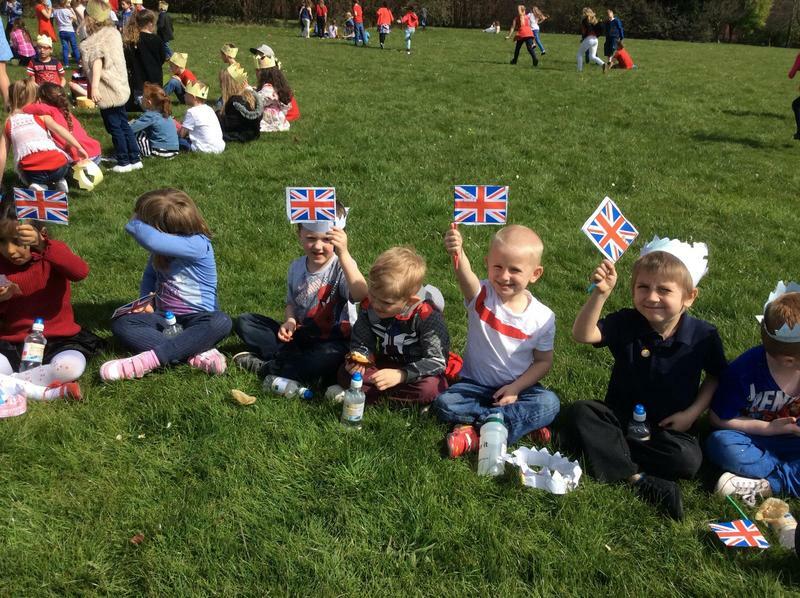 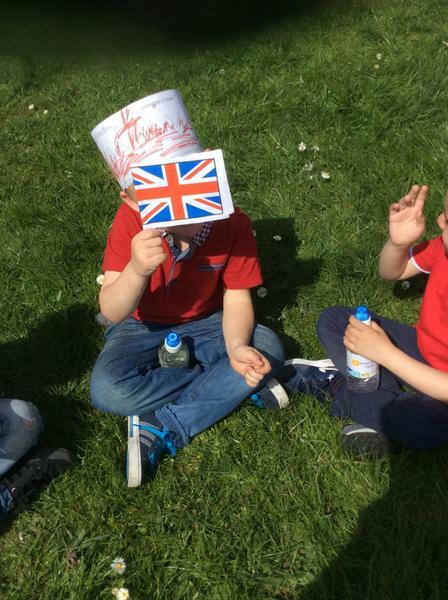 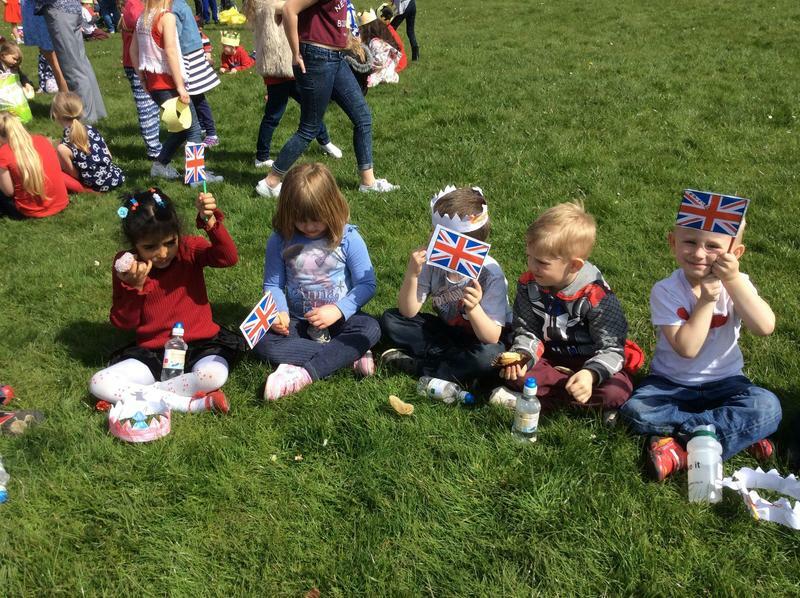 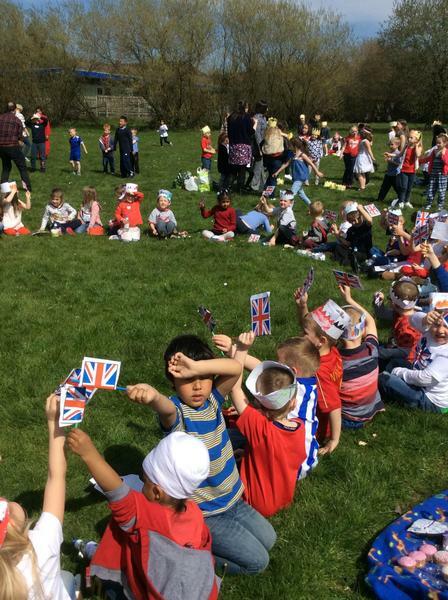 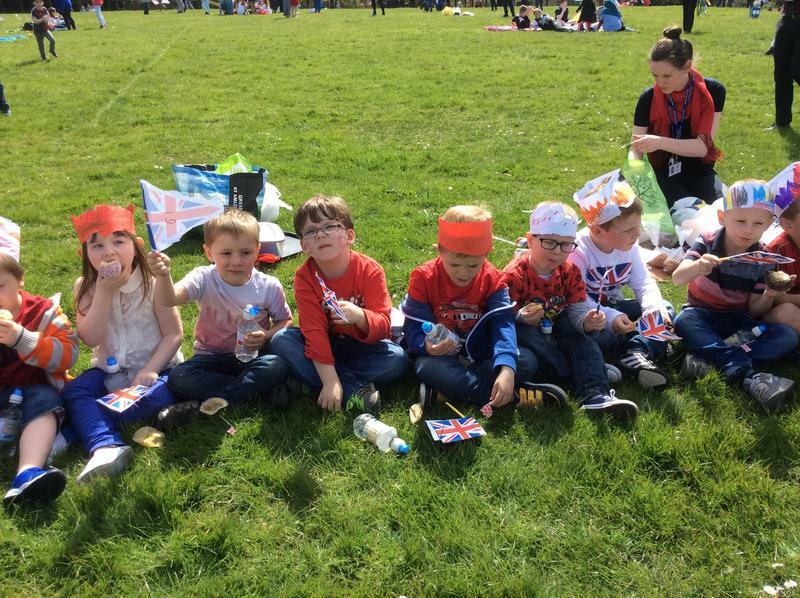 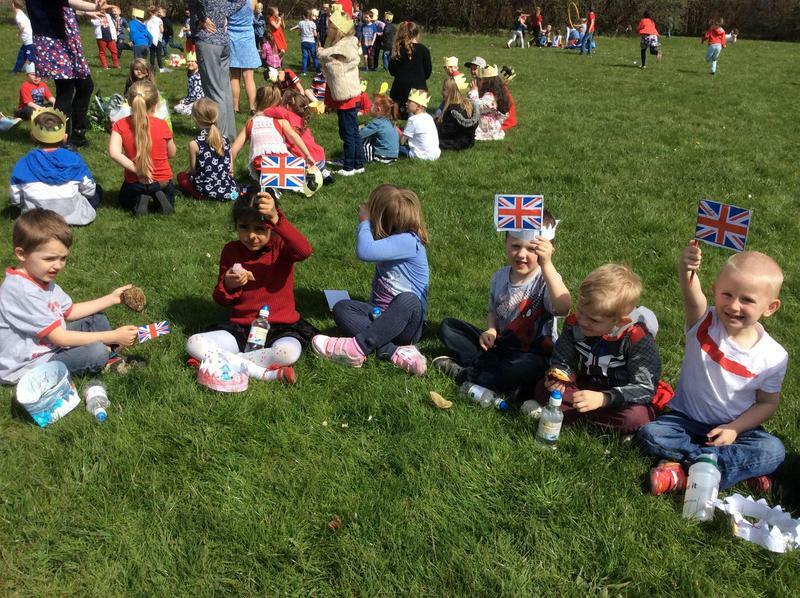 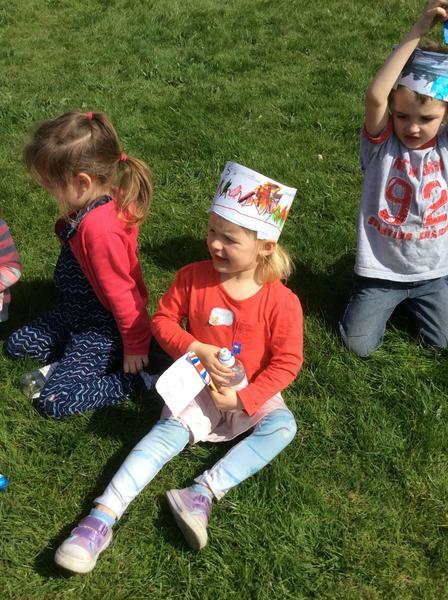 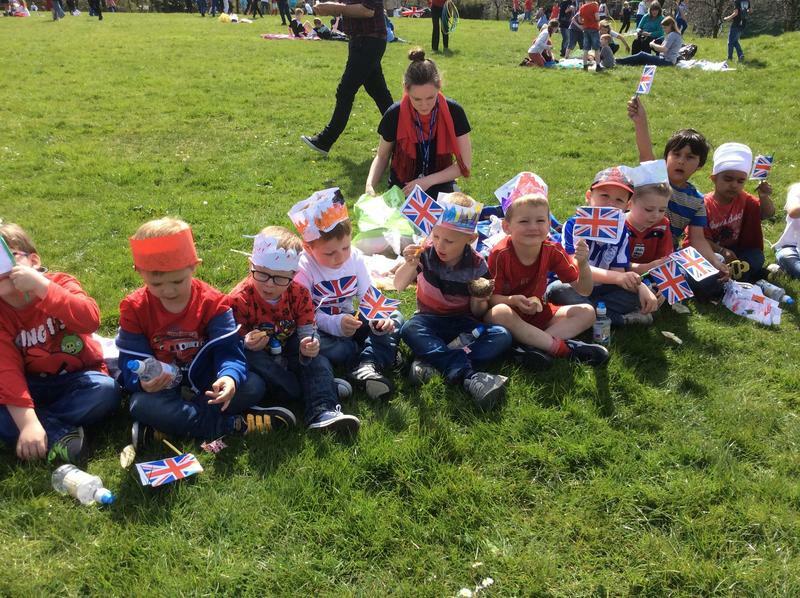 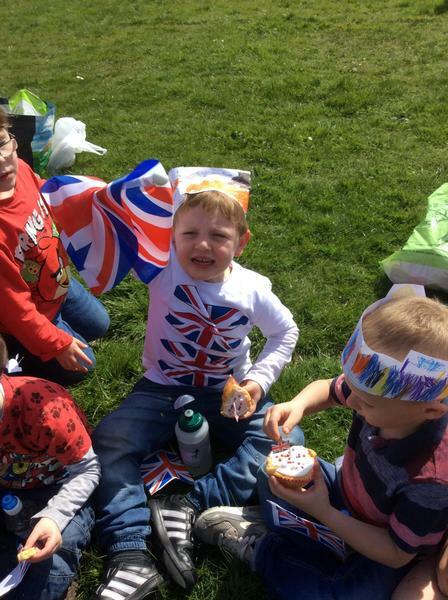 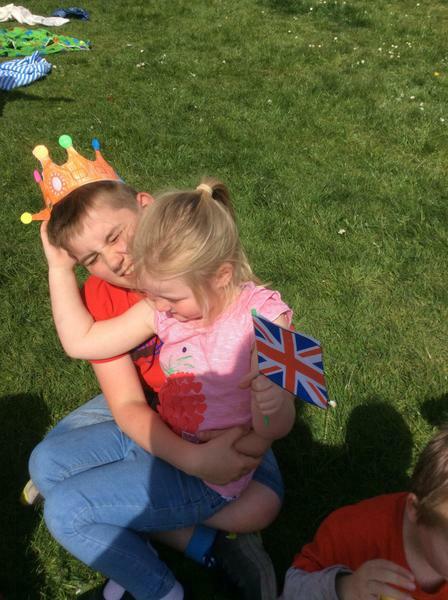 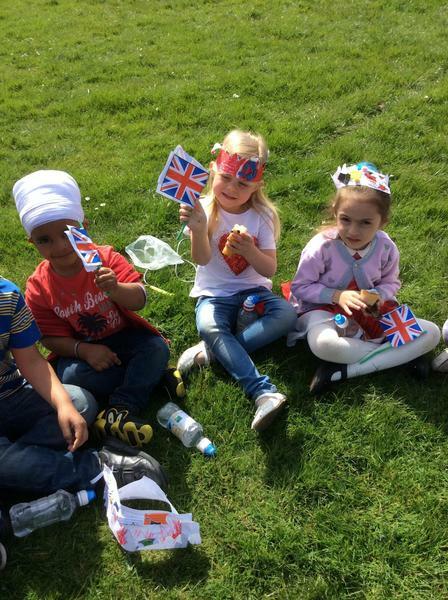 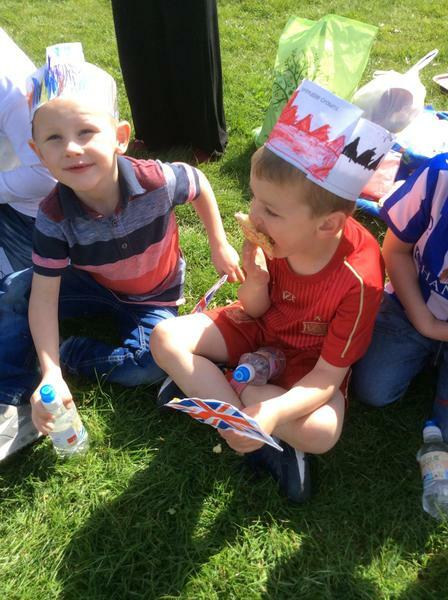 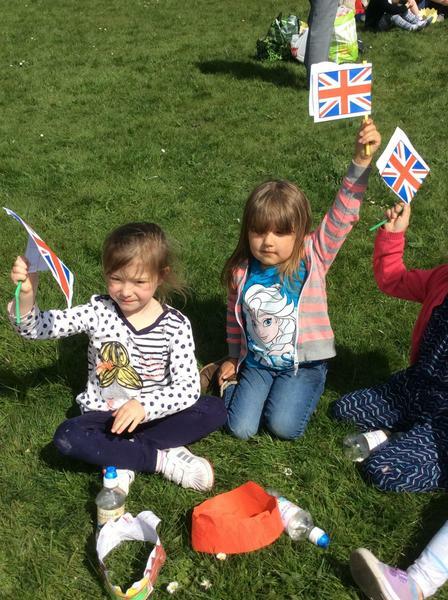 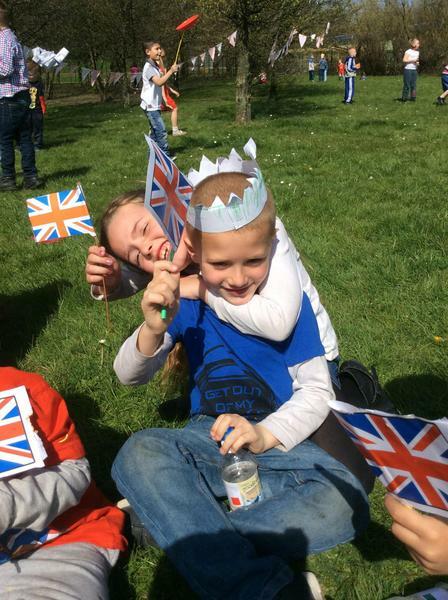 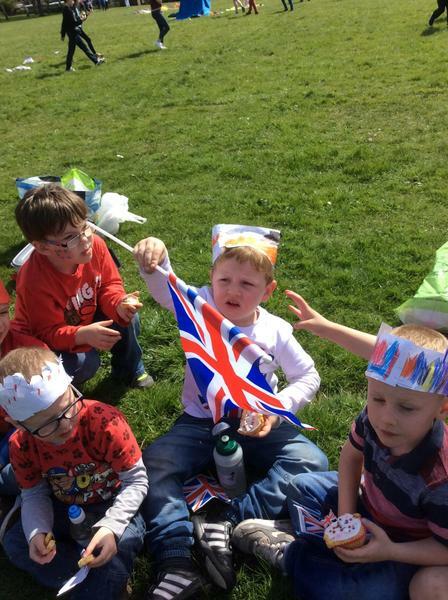 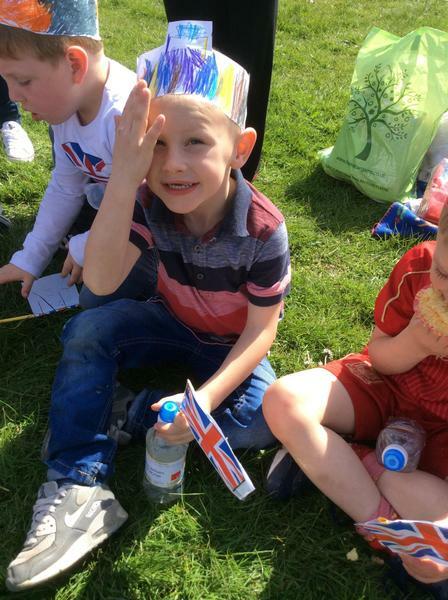 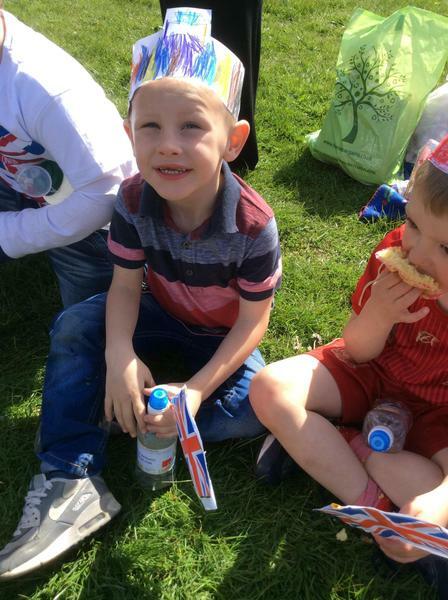 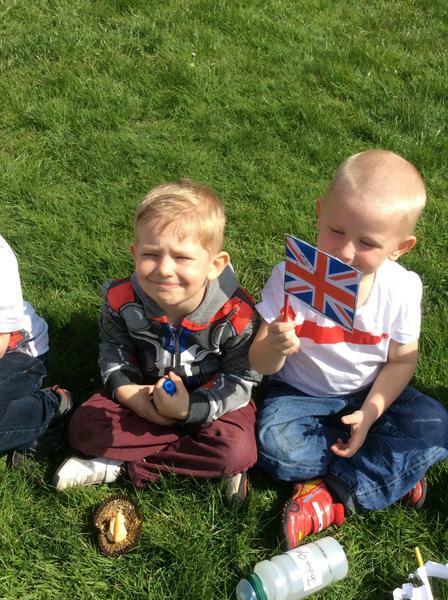 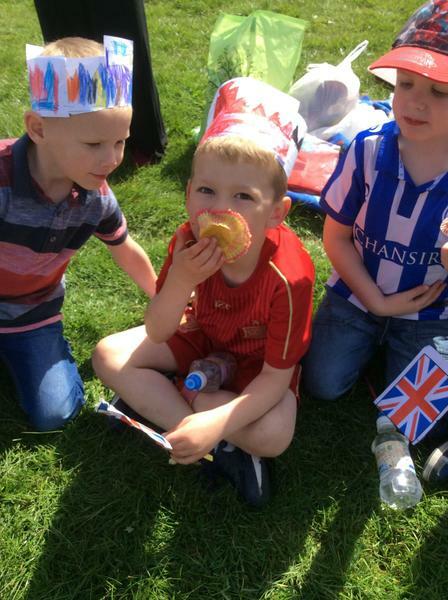 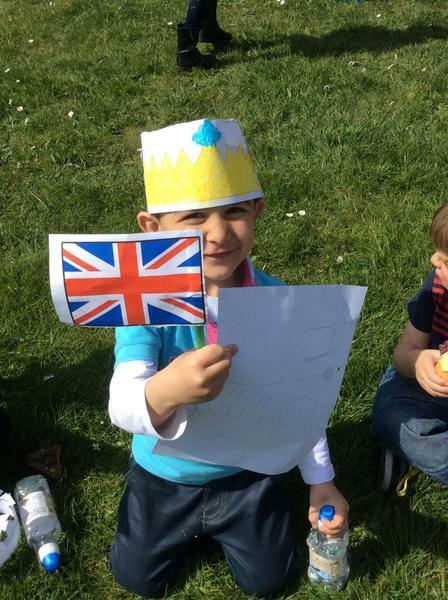 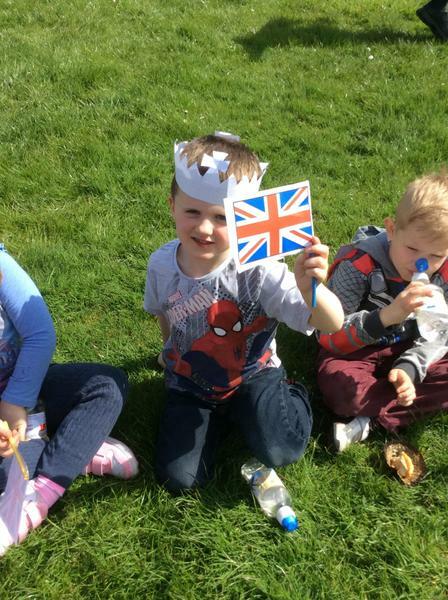 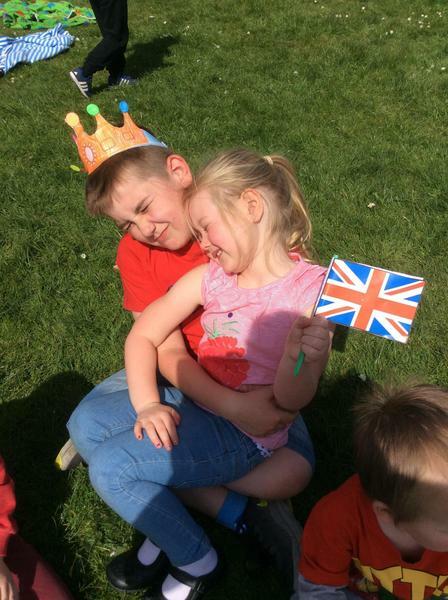 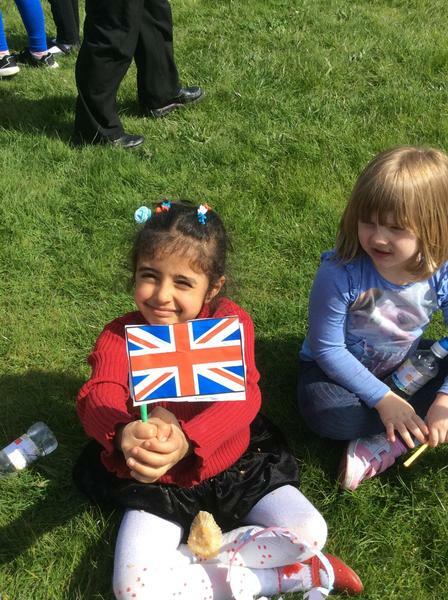 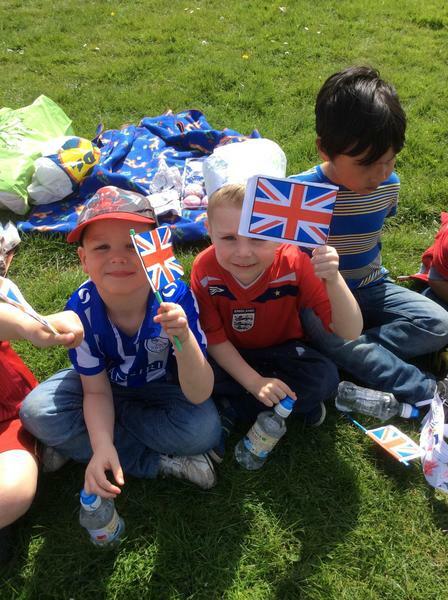 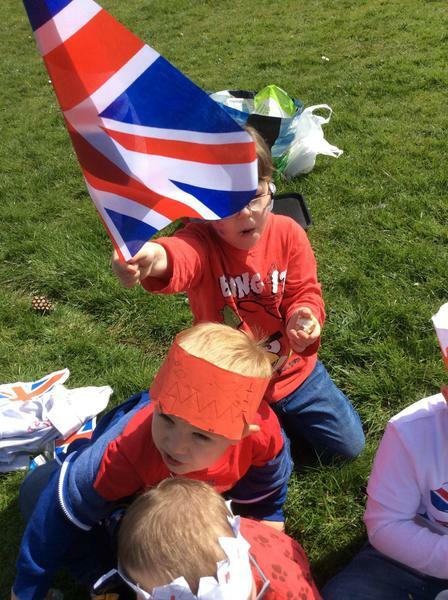 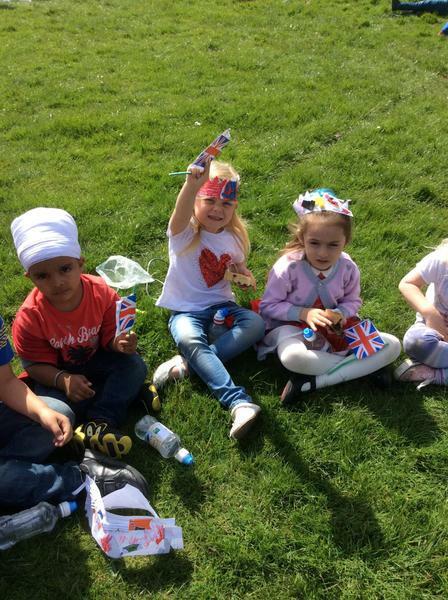 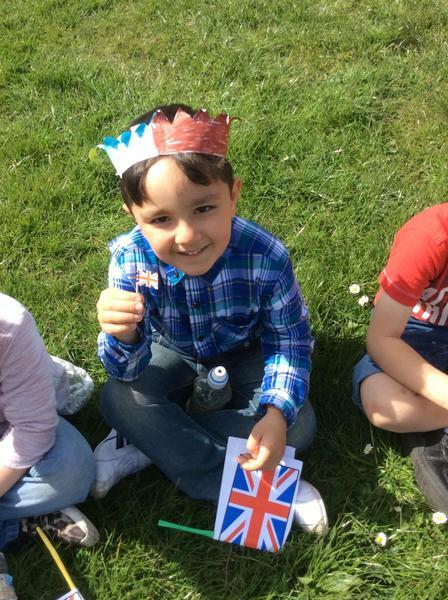 The children enjoyed learning all about the queen and her family. 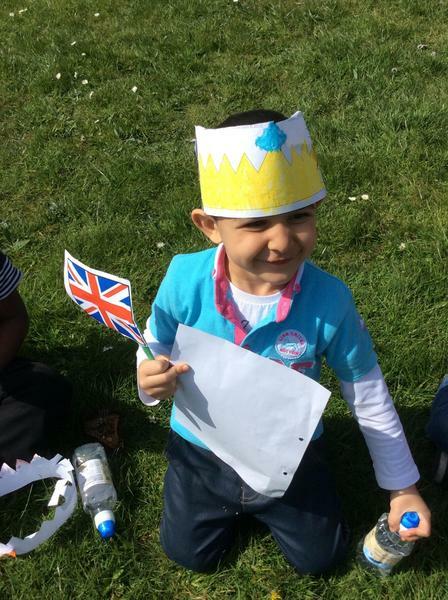 We looked at and talked about photographs of the queen as a baby and the Royal Family and their different roles. 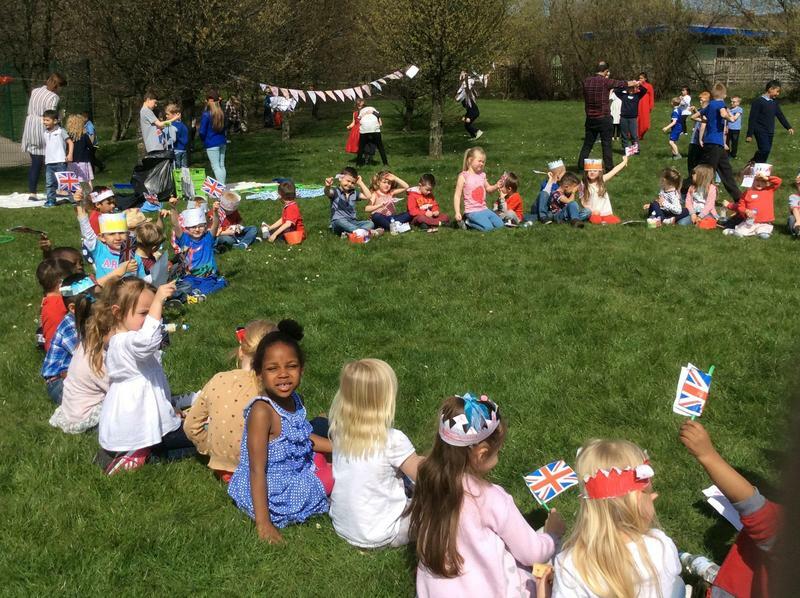 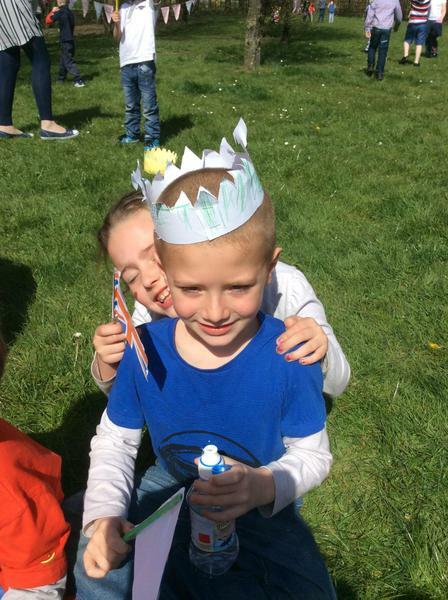 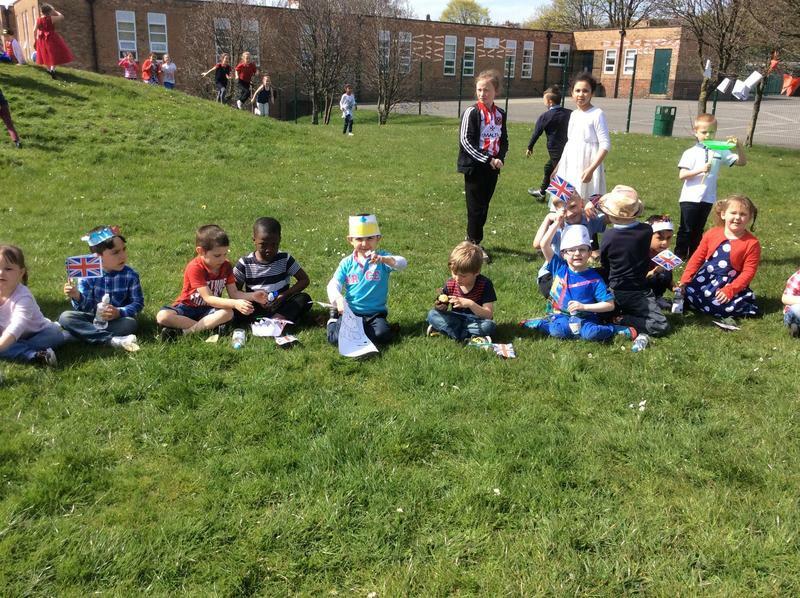 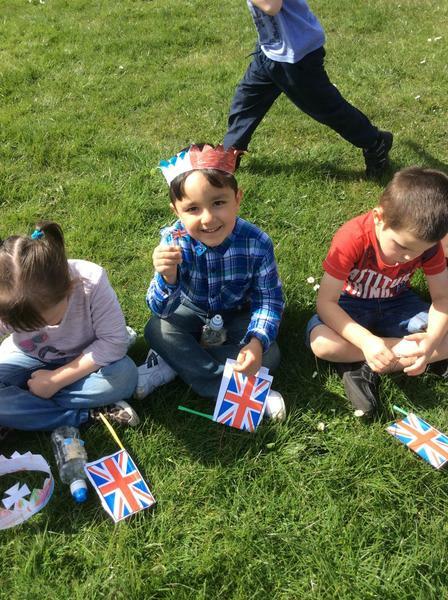 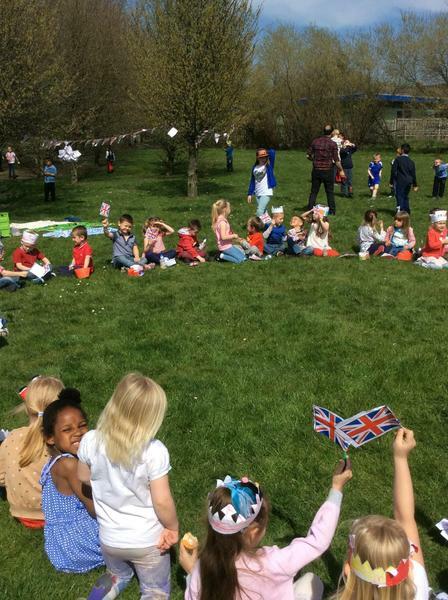 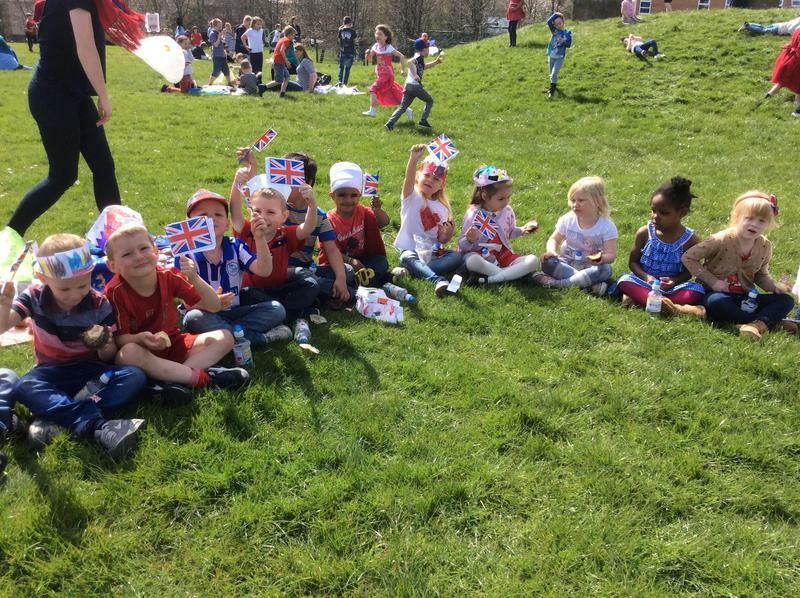 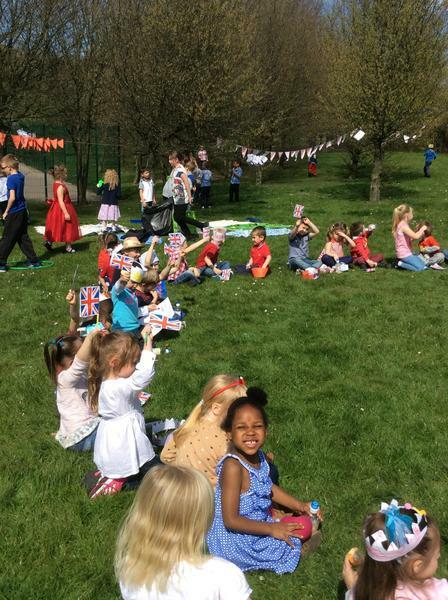 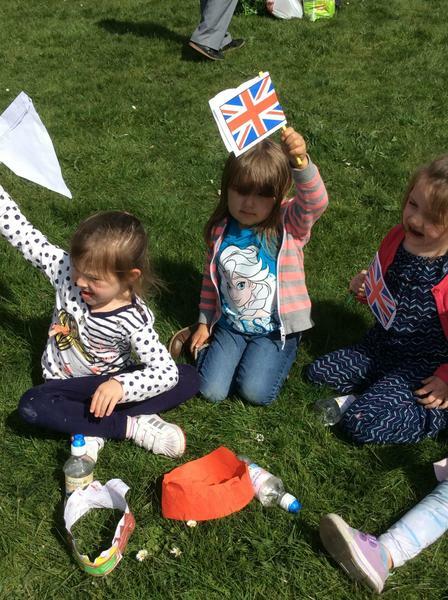 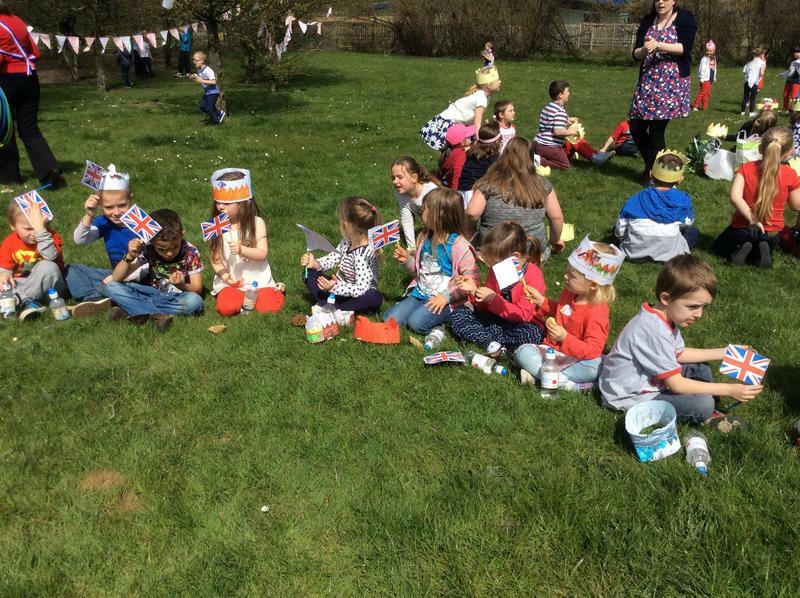 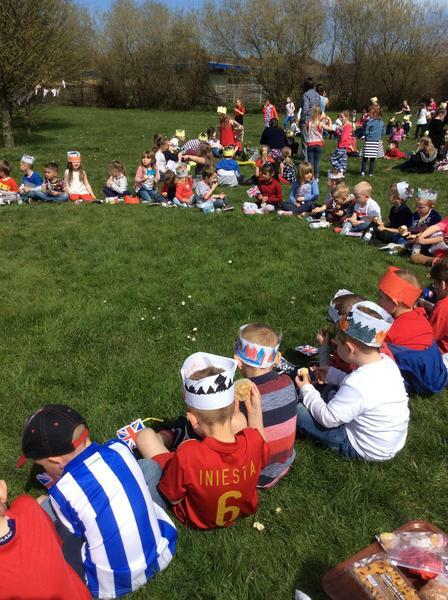 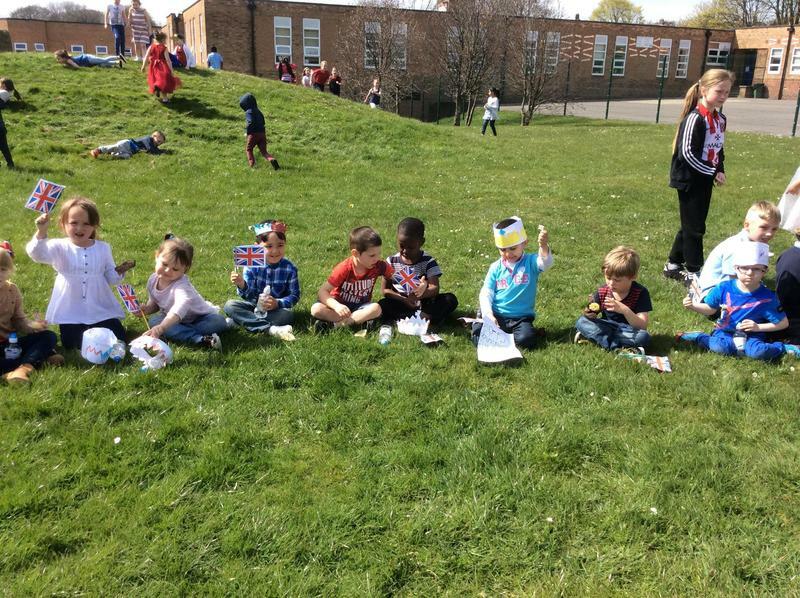 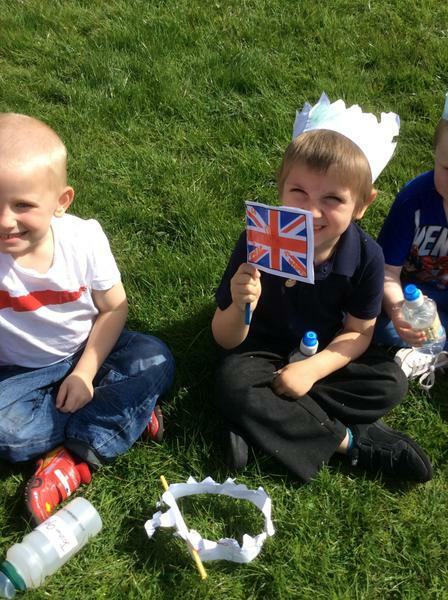 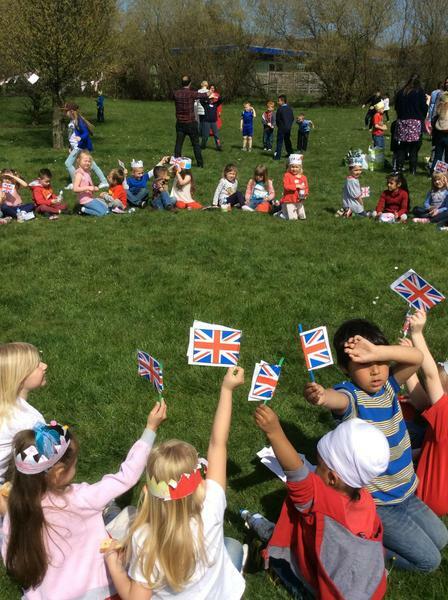 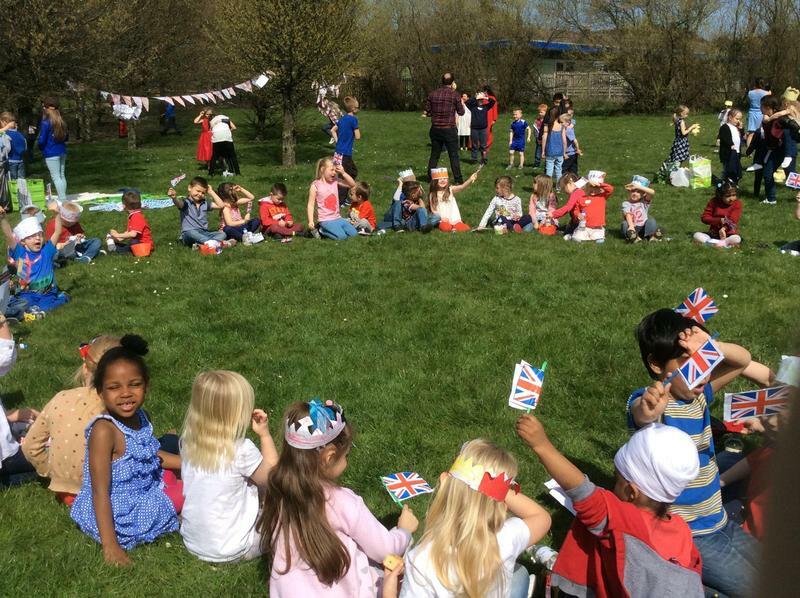 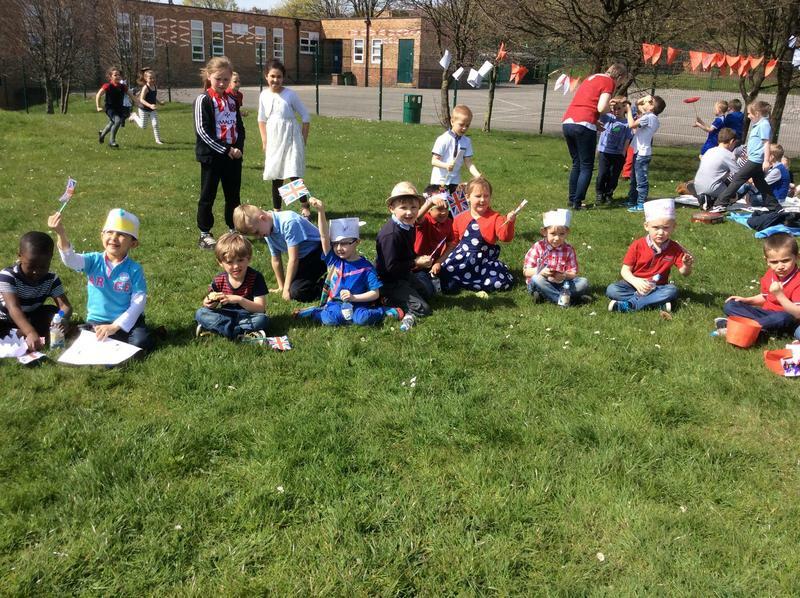 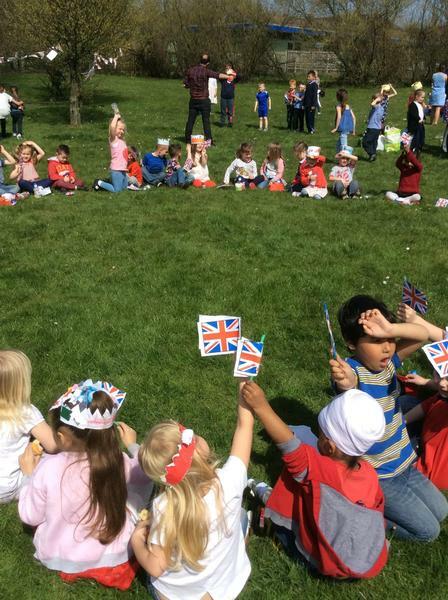 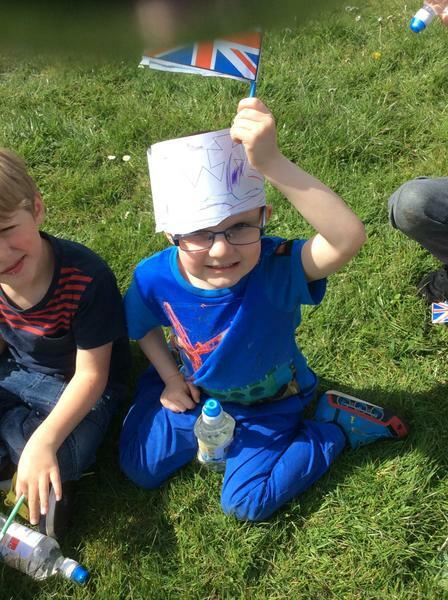 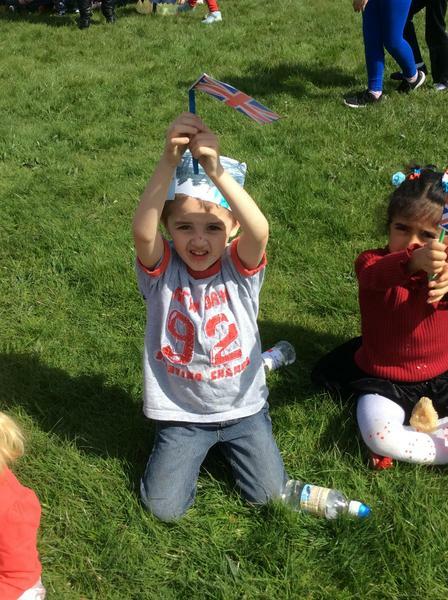 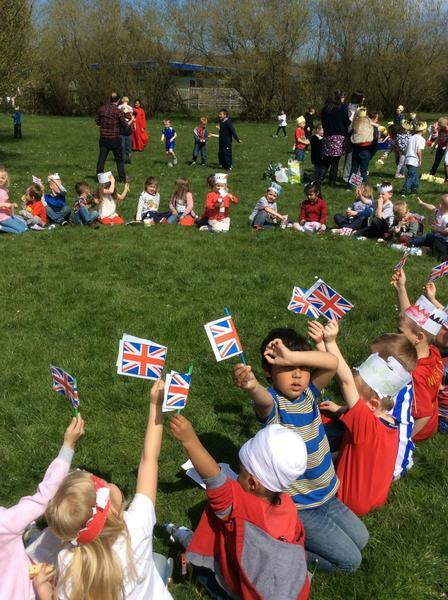 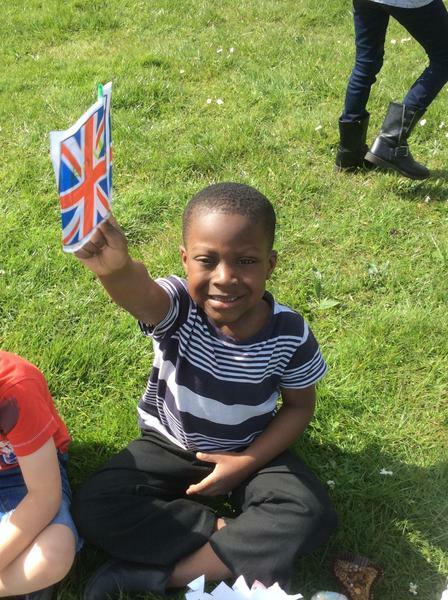 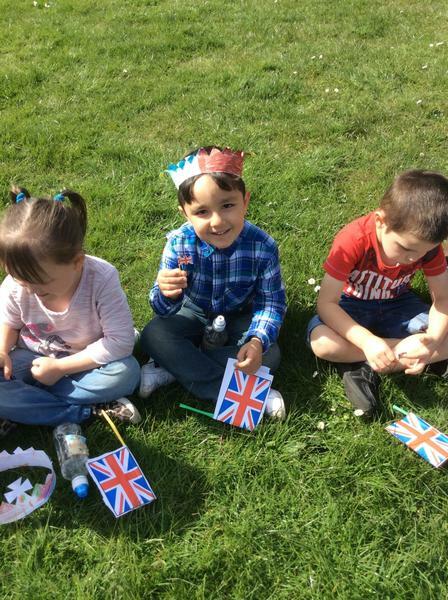 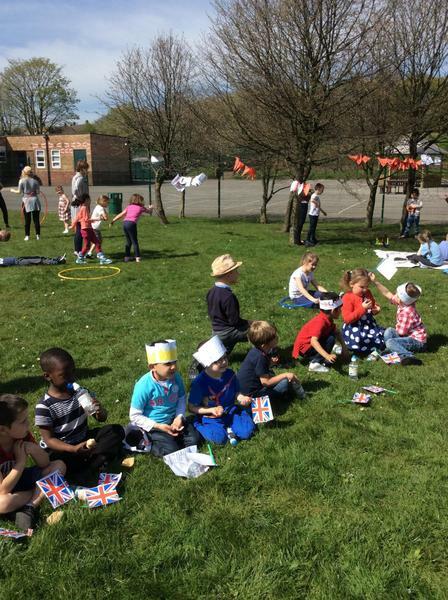 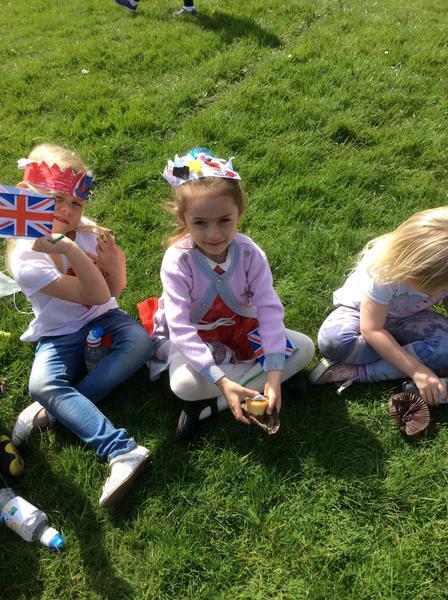 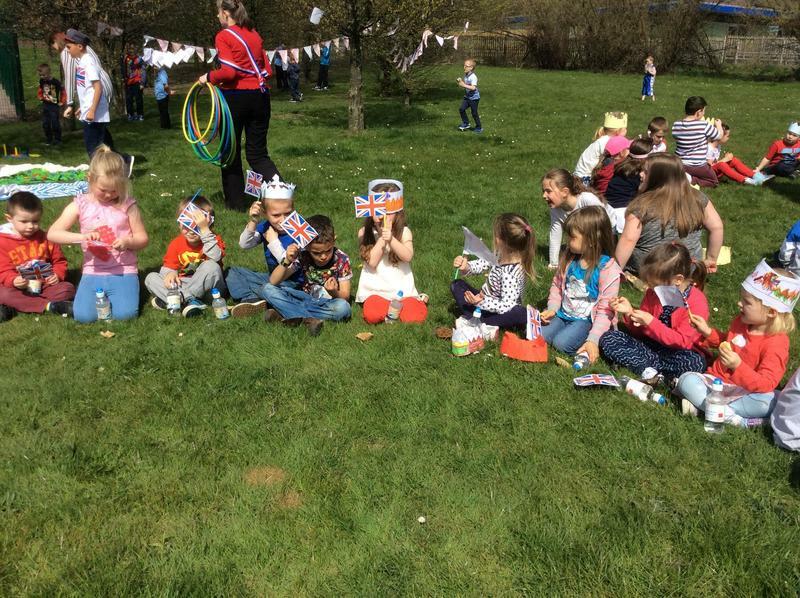 We made flags, bunting and crowns that we used when performing our special assembly to the grown ups and KS1. 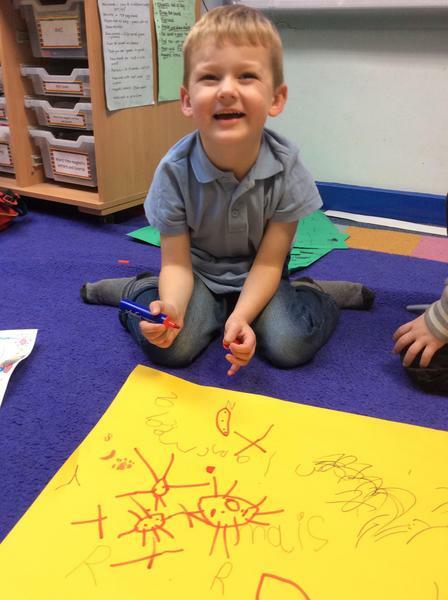 We practised our phonics by writing invitations and birthday cards. 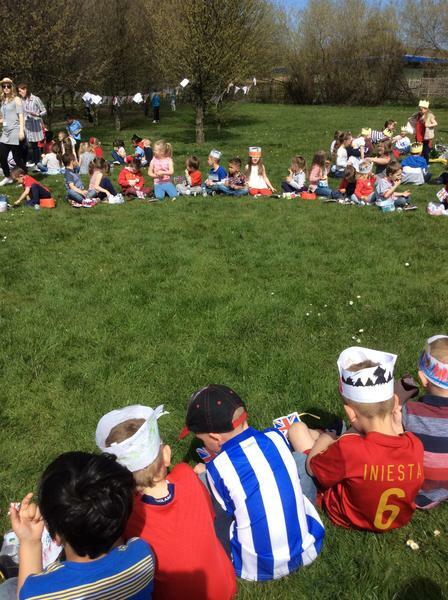 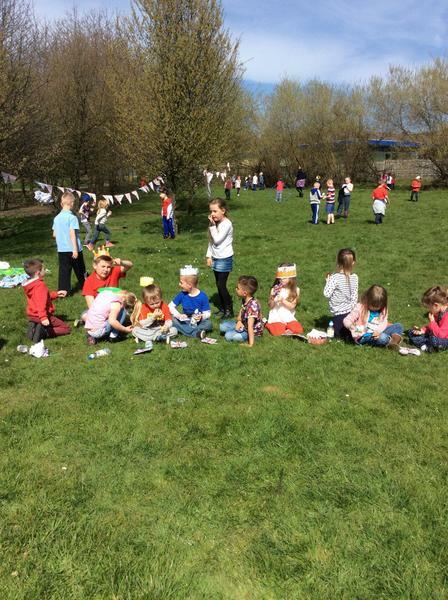 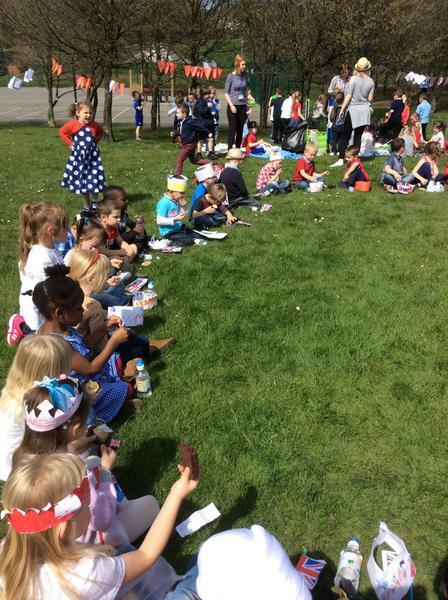 To finish off a fantastic day, we enjoyed afternoon tea on the field with the WHOLE school! 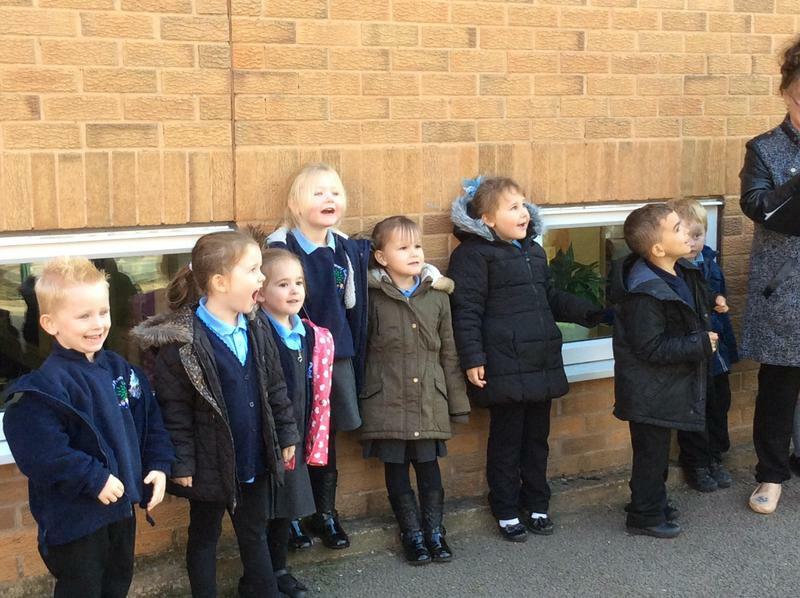 One requests your viewing of our very regal photographs (said in a very posh voice). 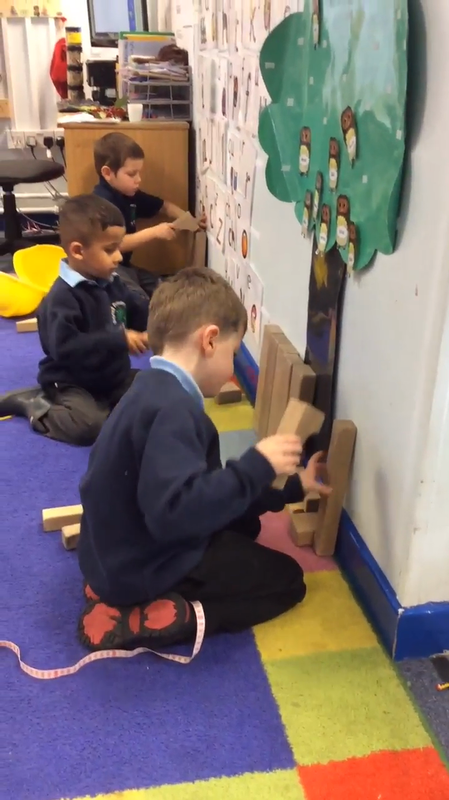 Check out our new Animoto! 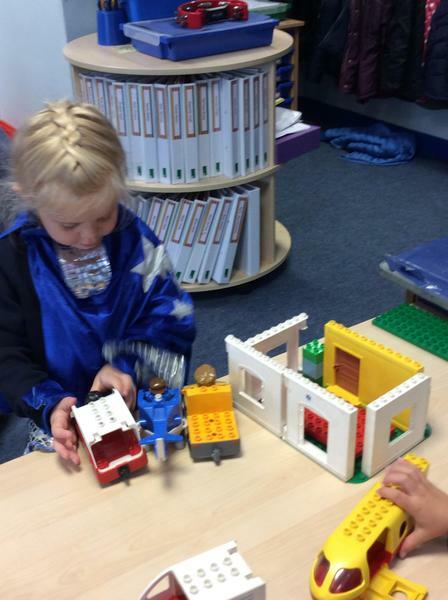 The boys tried different ways to build the wall for their fire station! 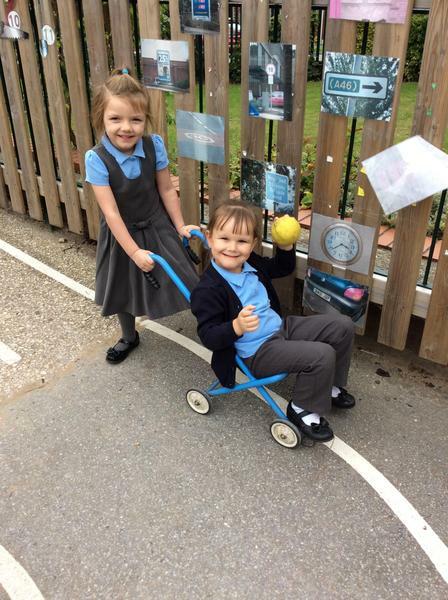 Great team work and innovative ideas! 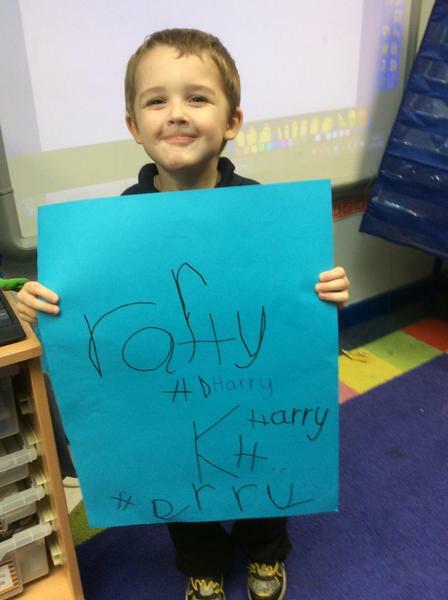 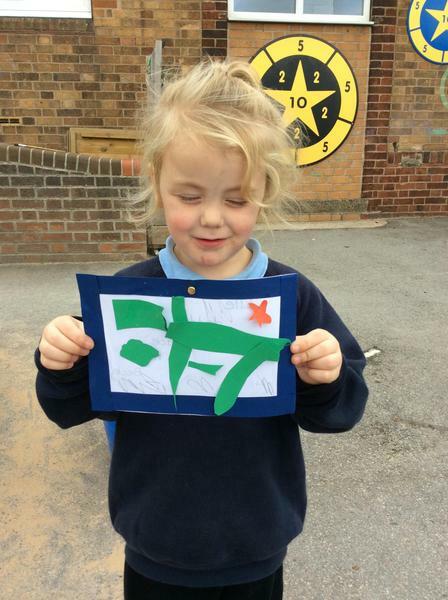 We'll print out a picture of your monster to take home and when they send you letters we'll print them out too! 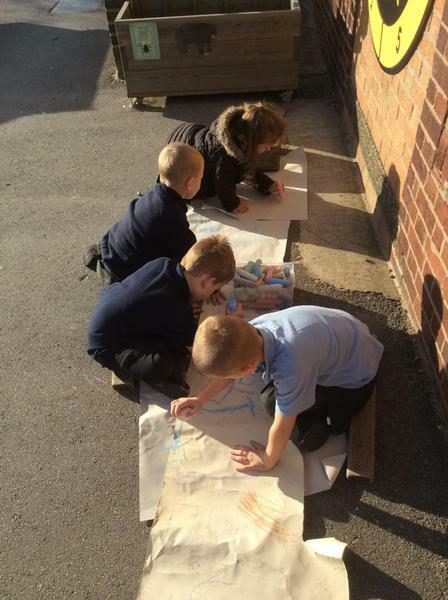 The boys have really enjoyed writing using chalks, pens, pencils and water. 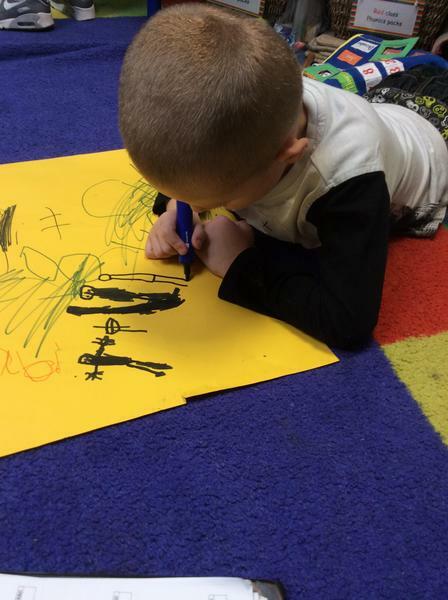 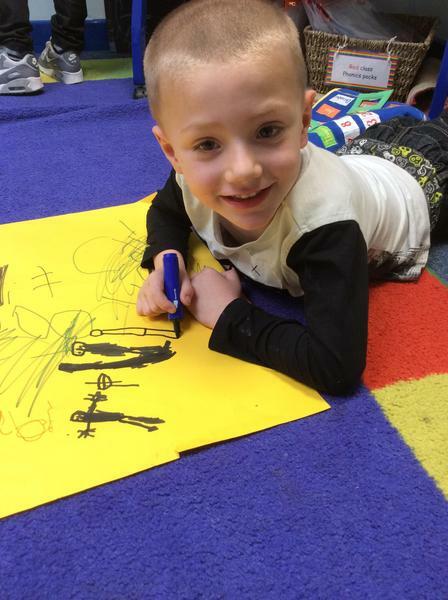 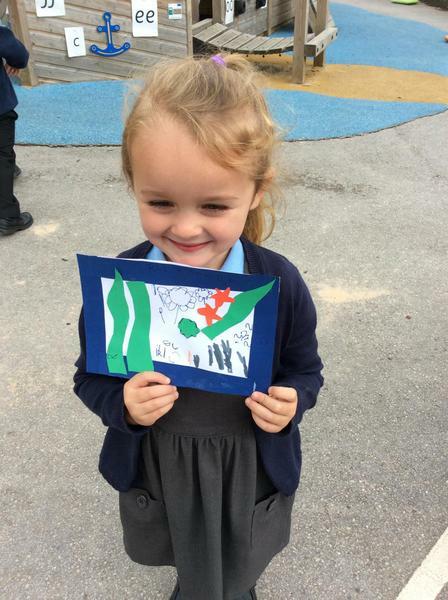 They have loved writing their names and the sound of the day on huge pieces of paper on the carpet. 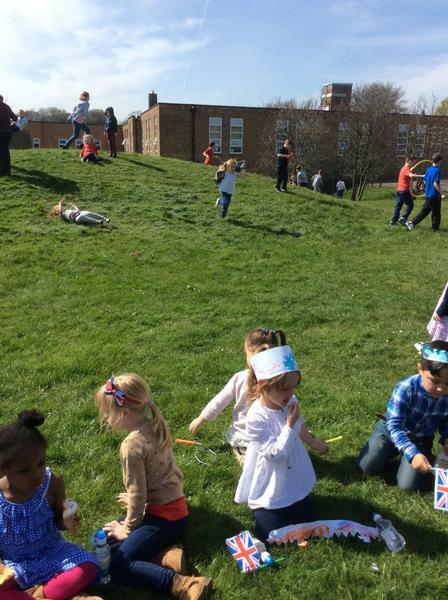 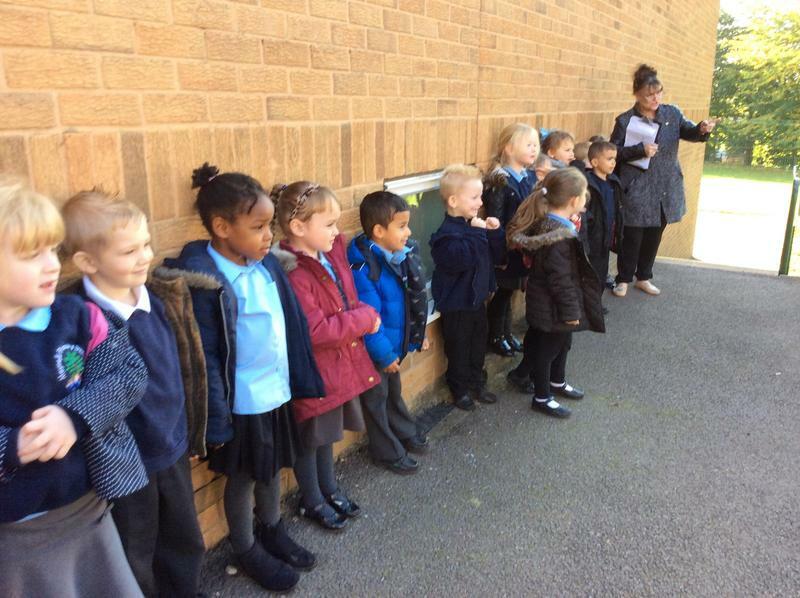 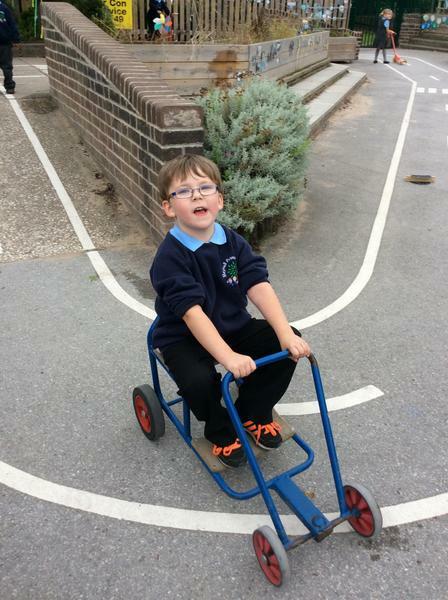 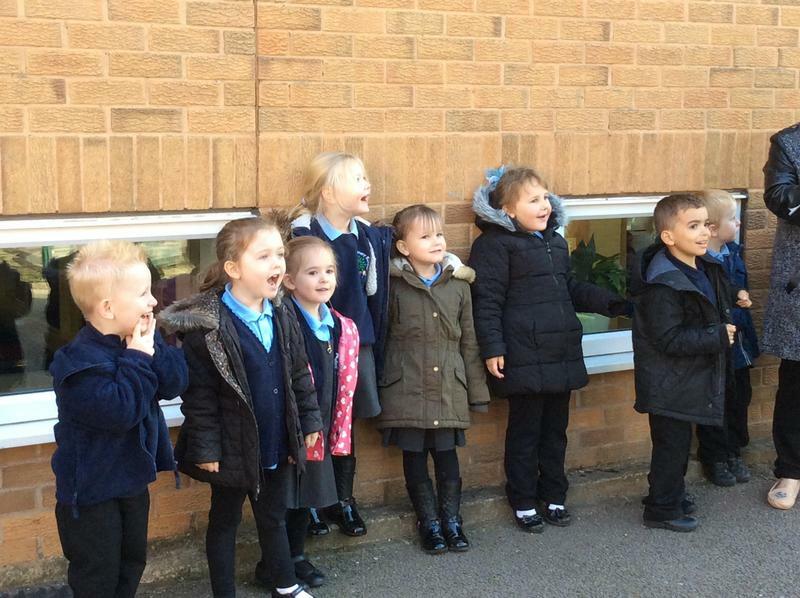 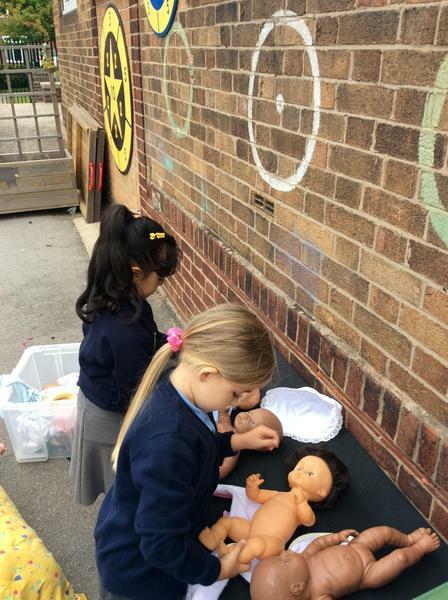 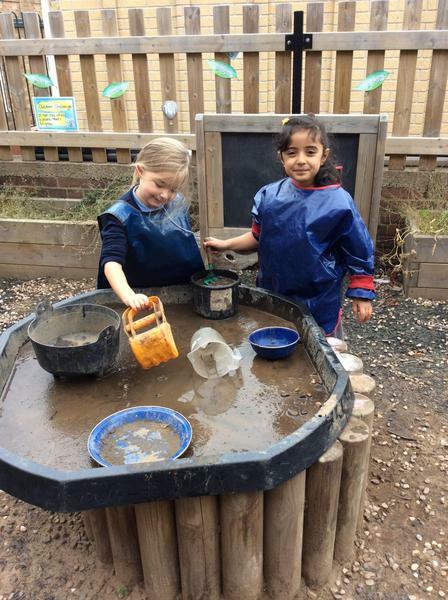 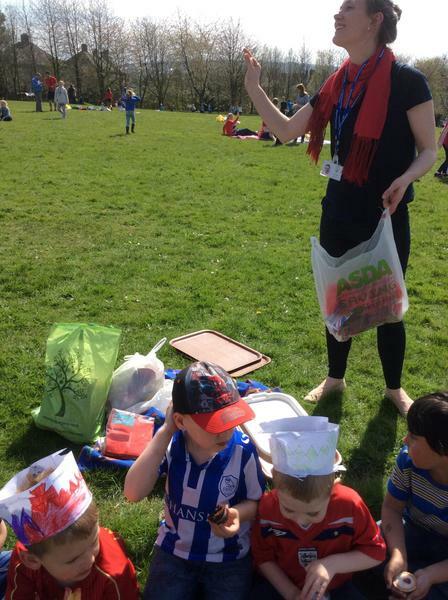 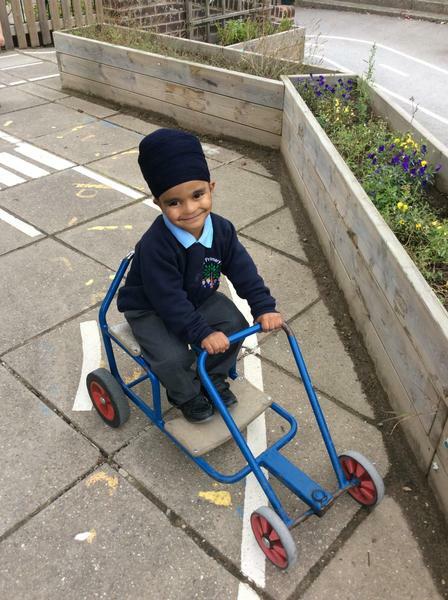 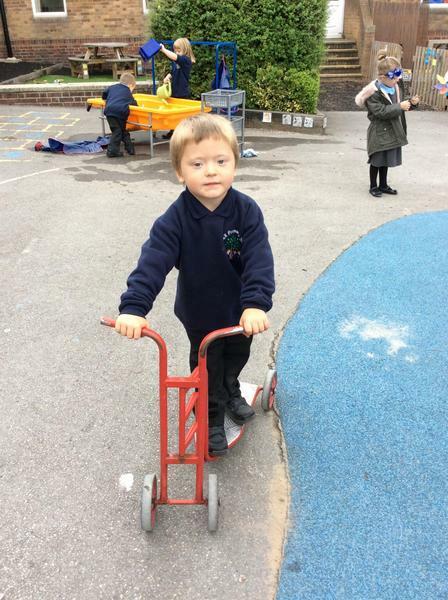 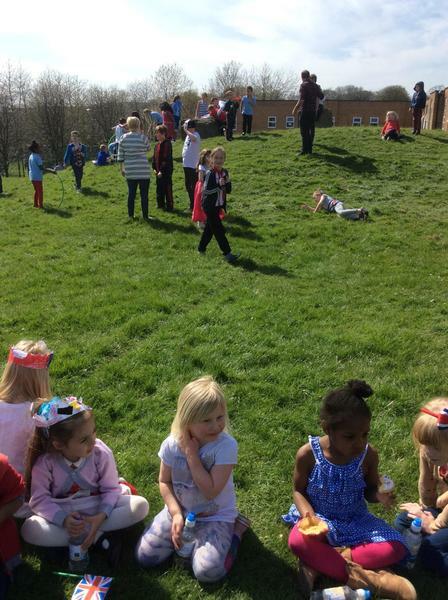 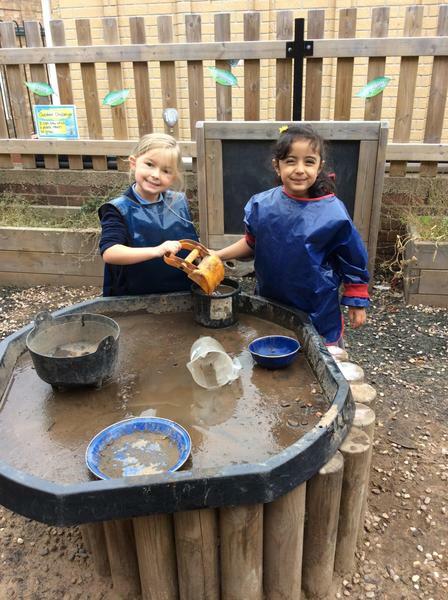 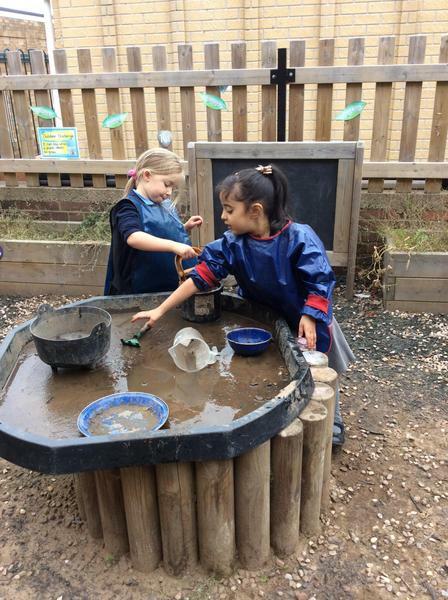 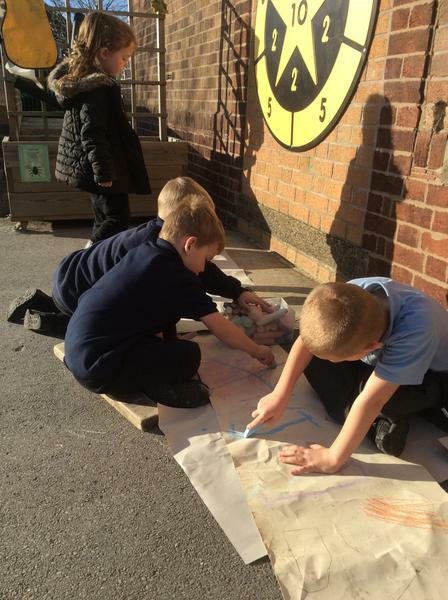 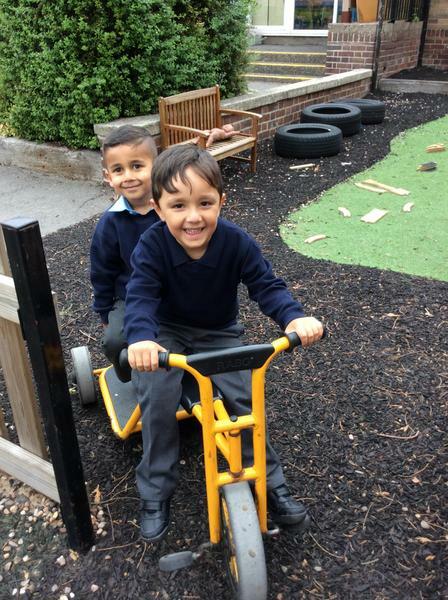 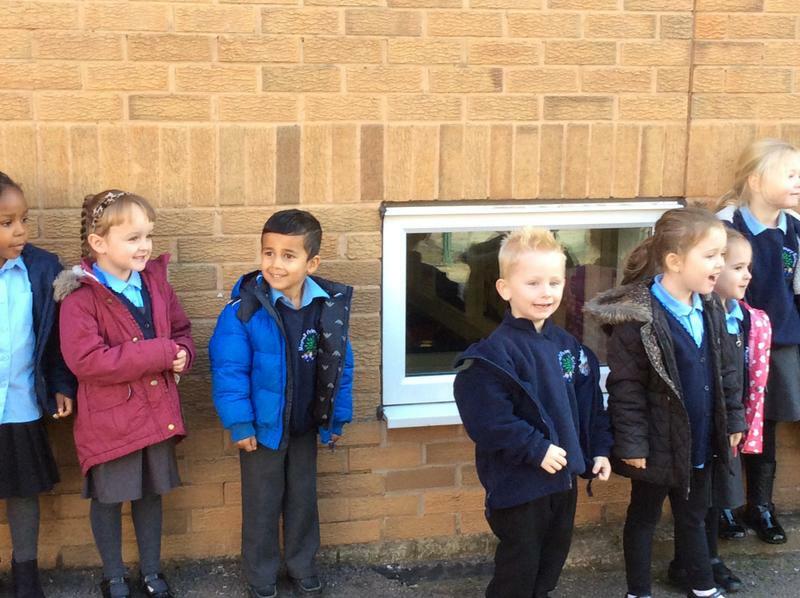 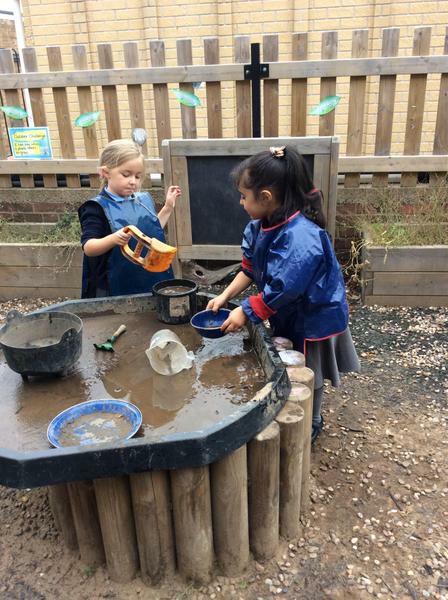 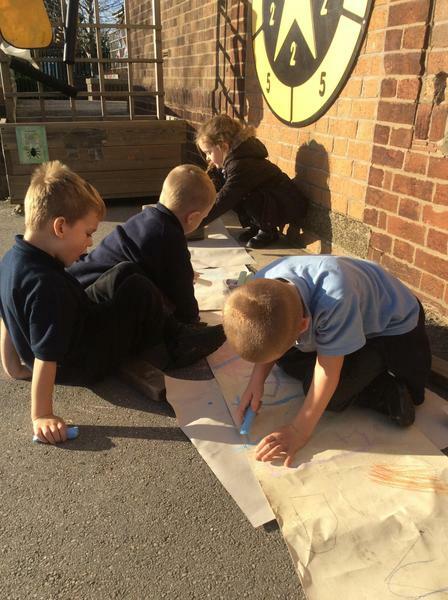 Some of the children went outside and found new exciting places to write. 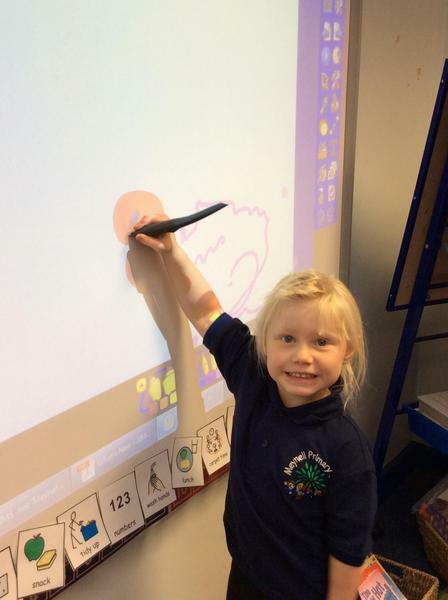 I wonder where you like to write? 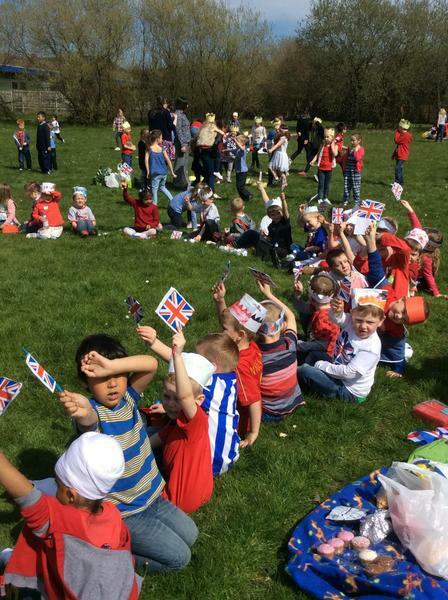 Today the children thought about the people and soldiers who died during wars in the past. 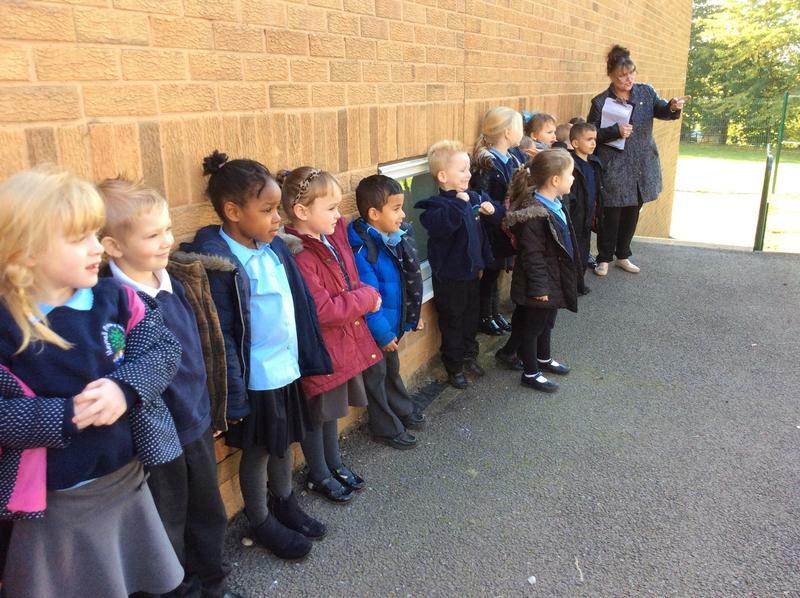 They sat together at 11oclock to have a minute silence. 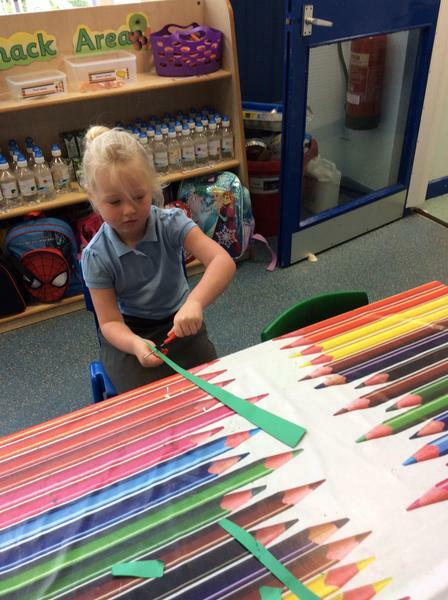 The children enjoyed making poppies in the classroom as a symbol of their remembrance. 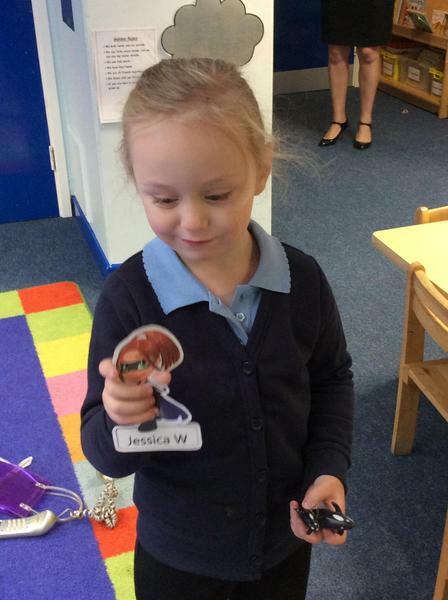 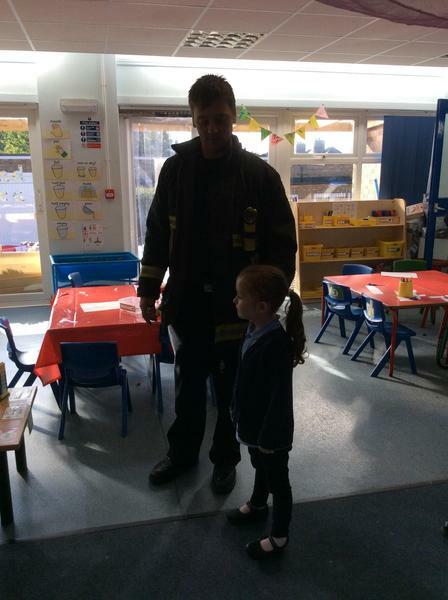 In FS2 the children have had some very special visitors. 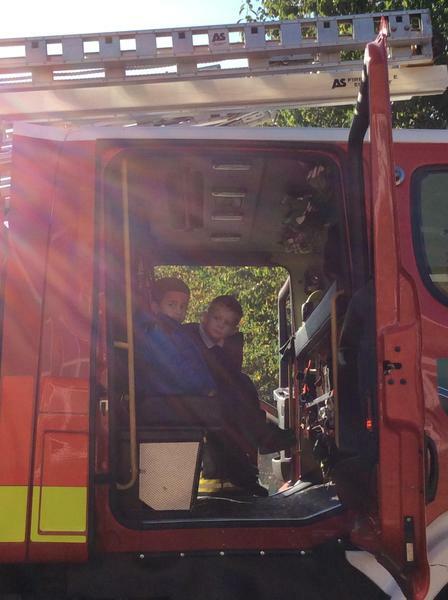 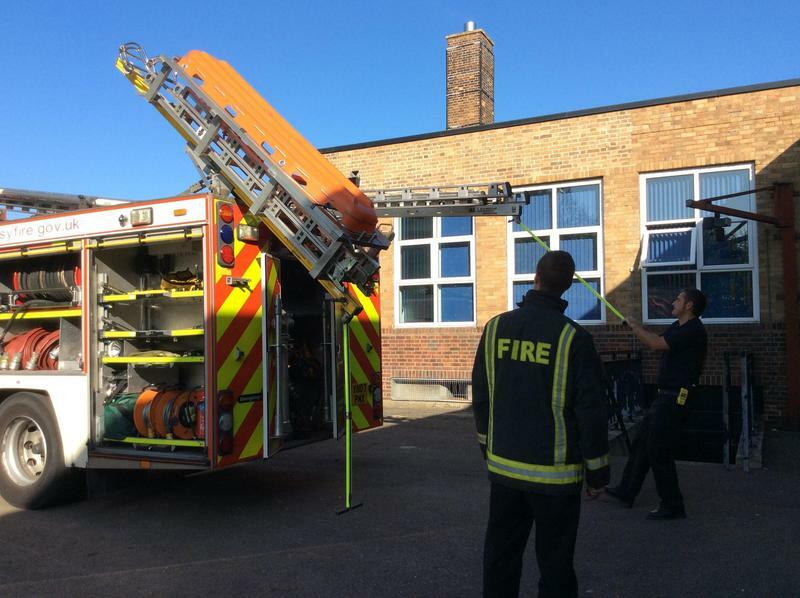 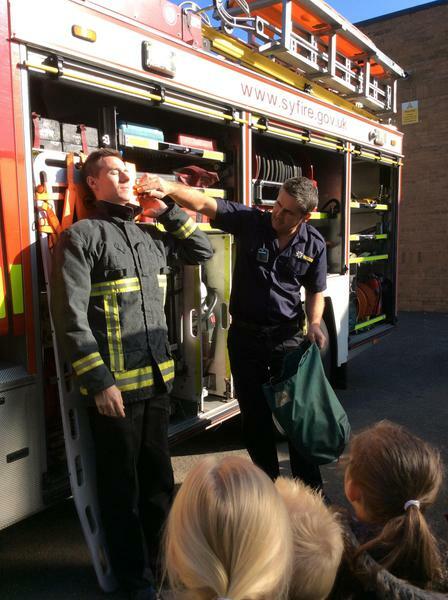 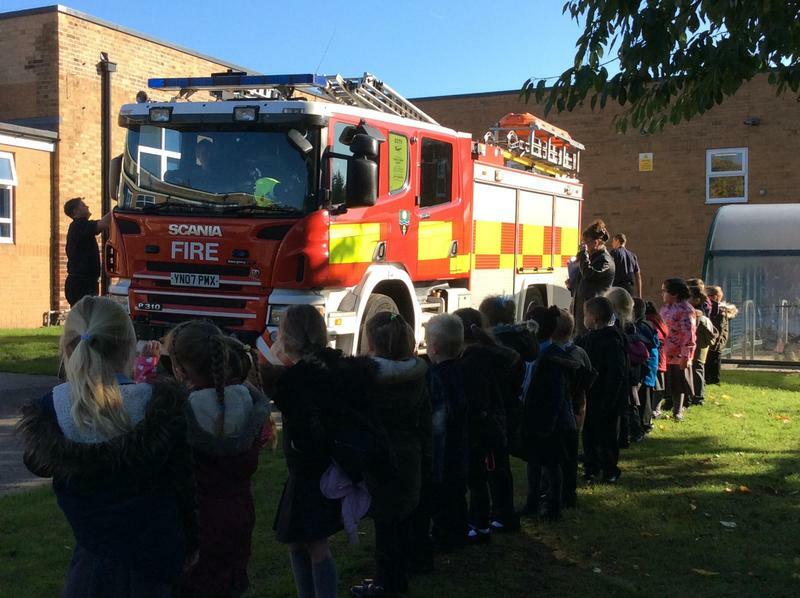 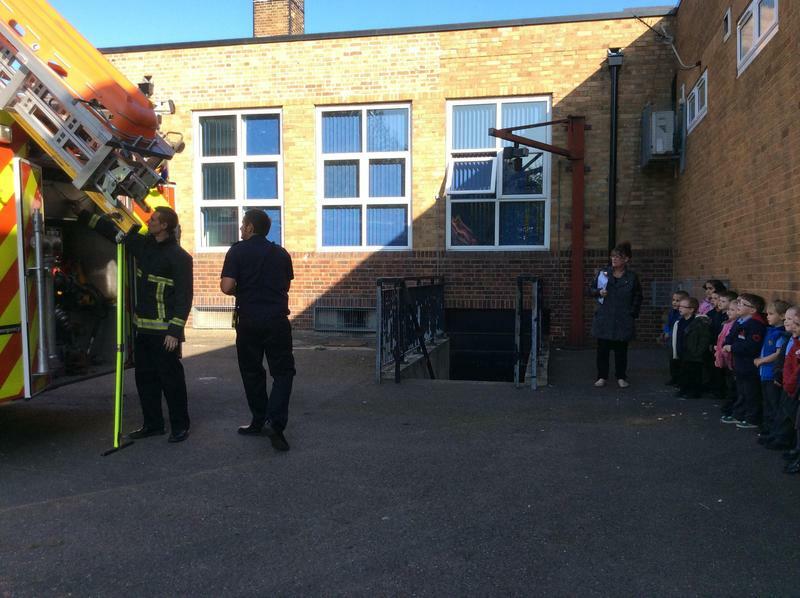 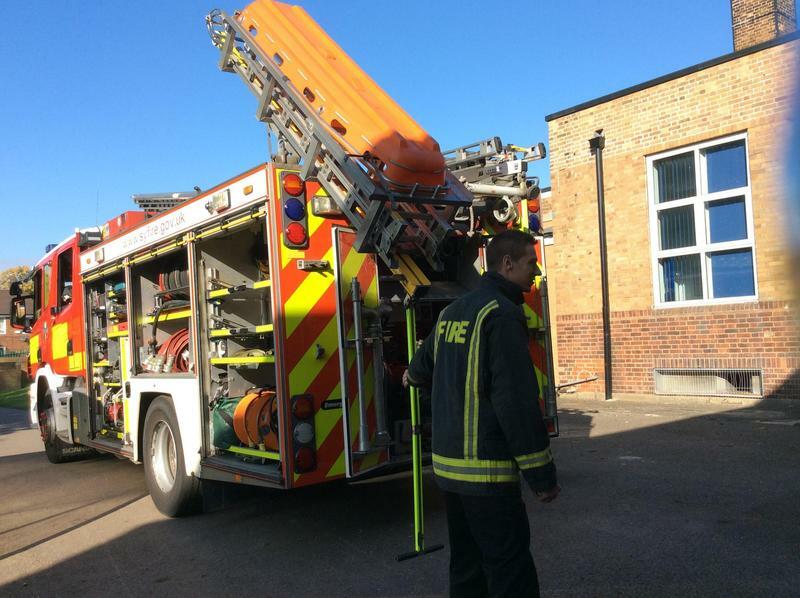 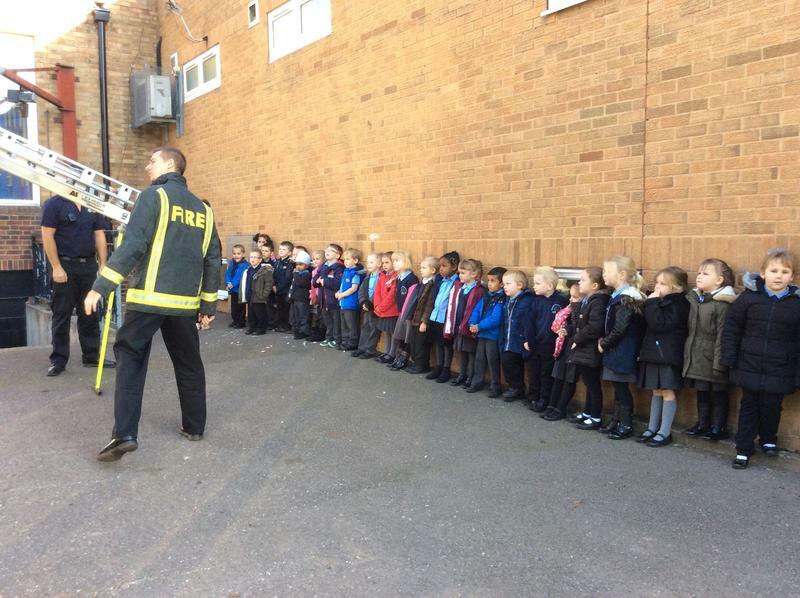 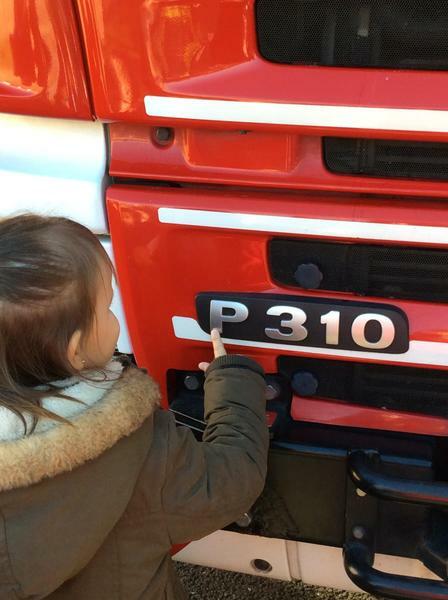 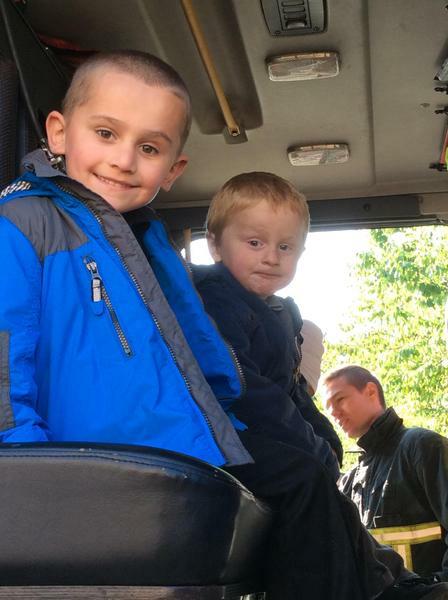 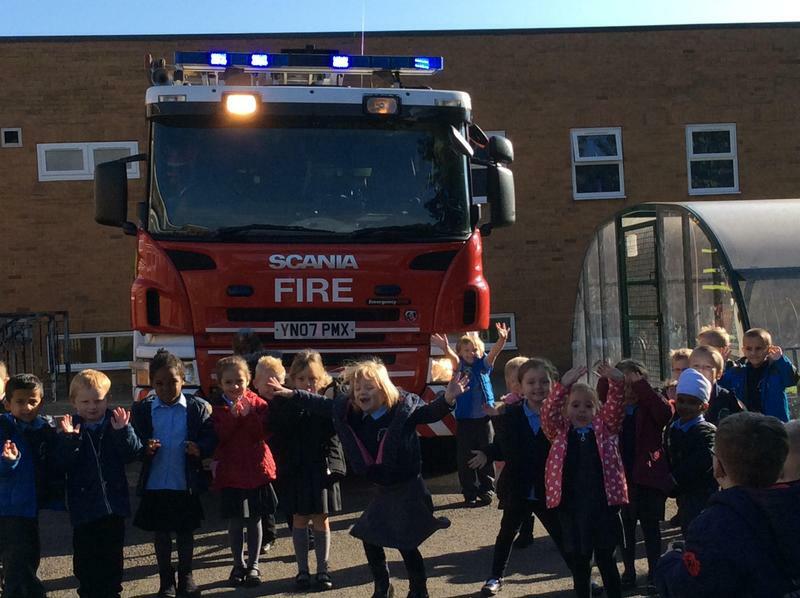 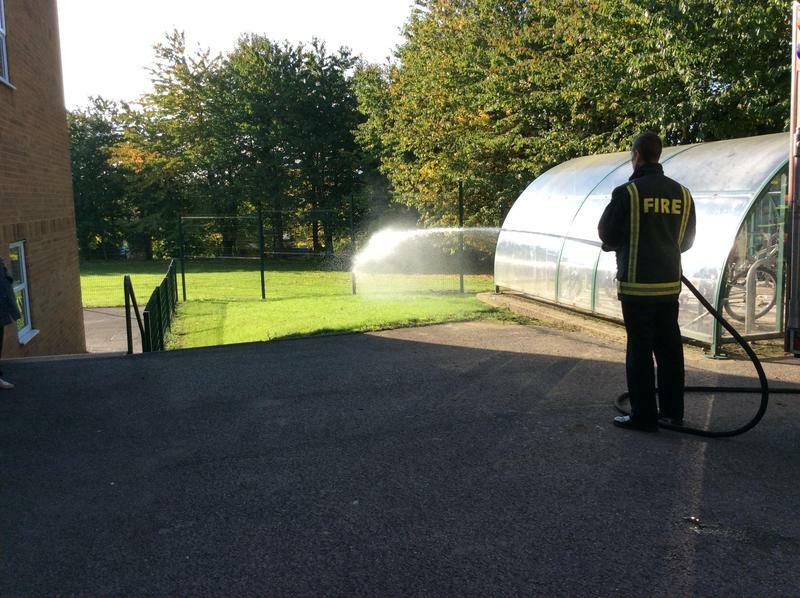 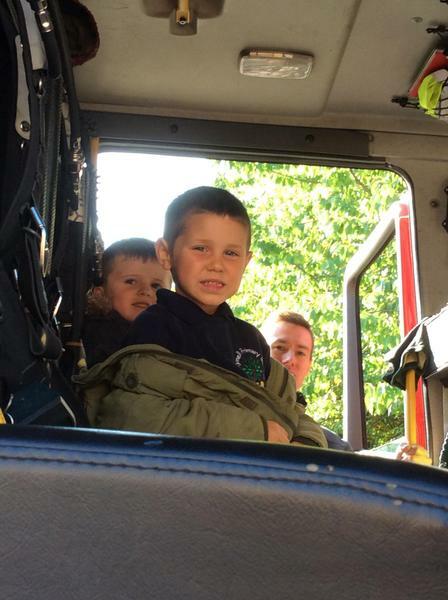 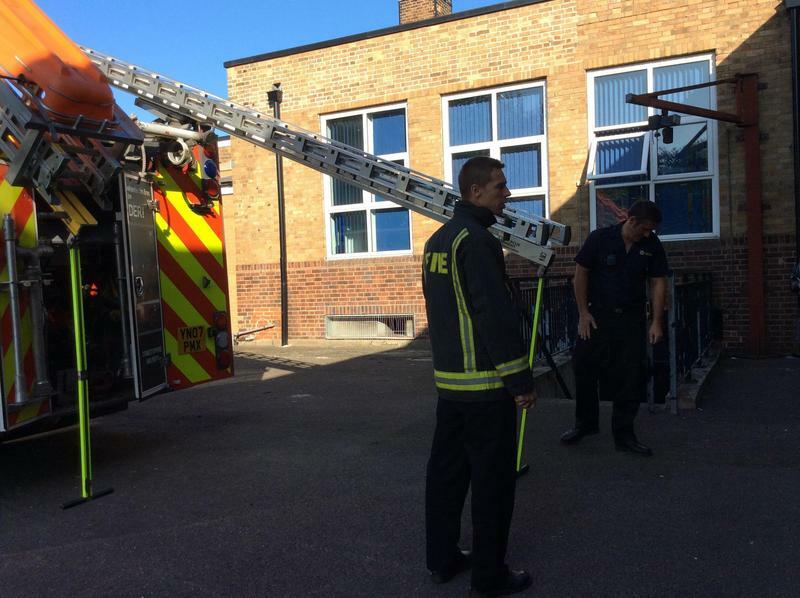 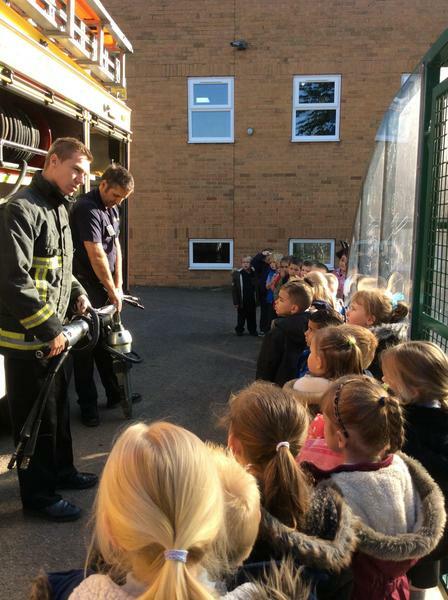 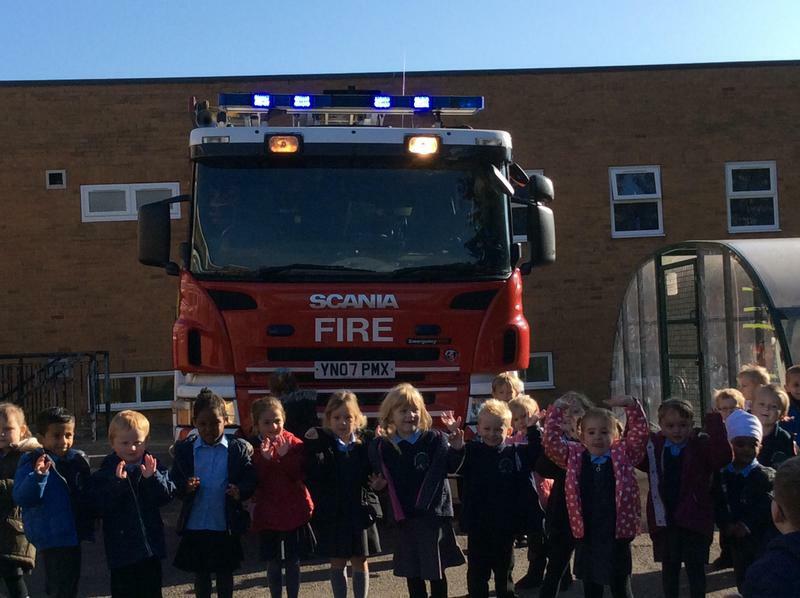 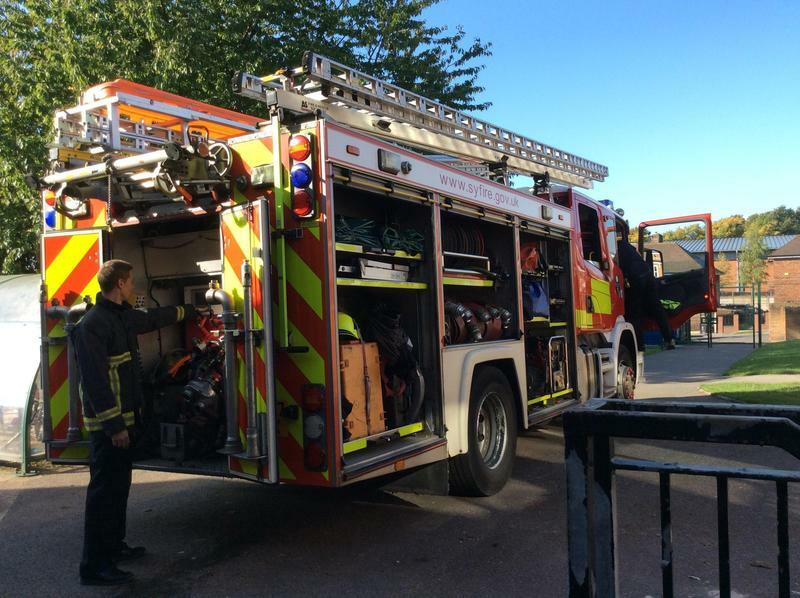 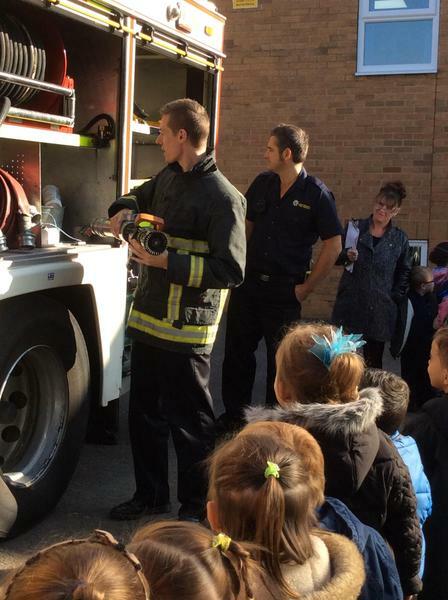 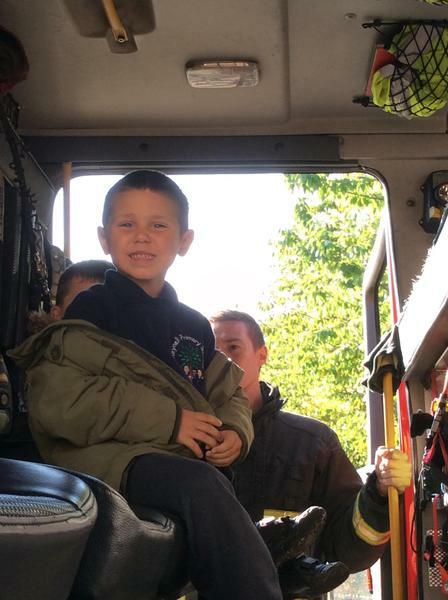 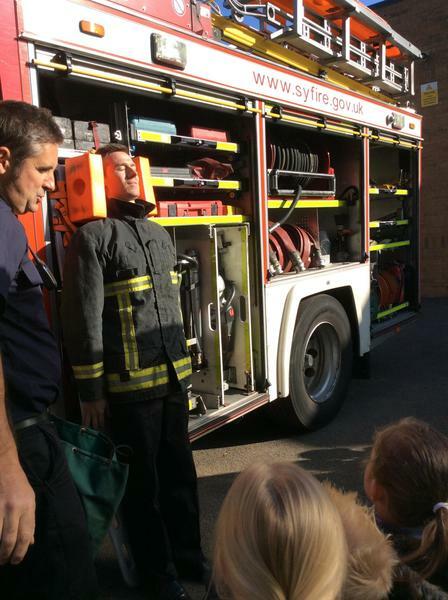 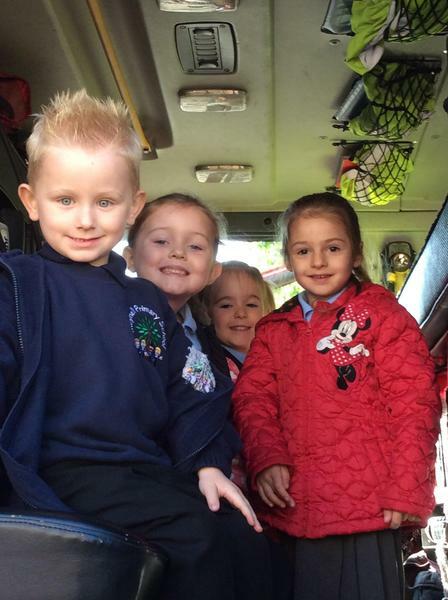 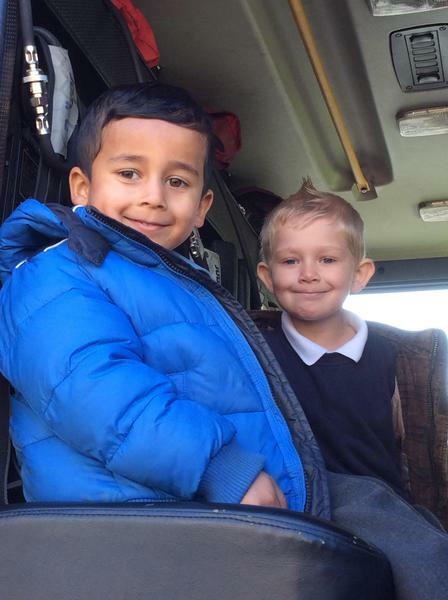 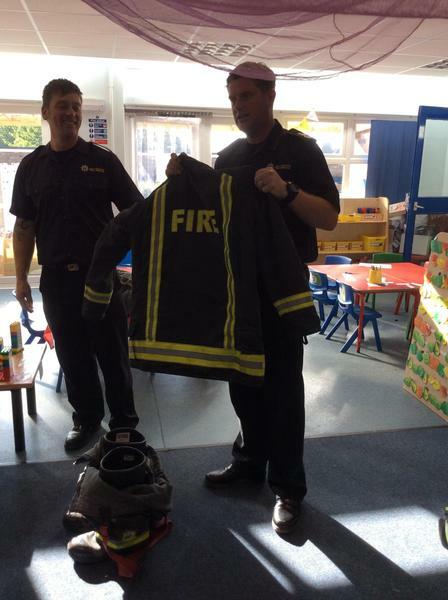 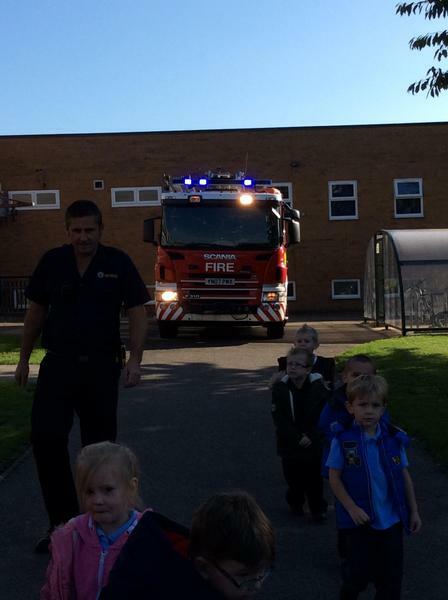 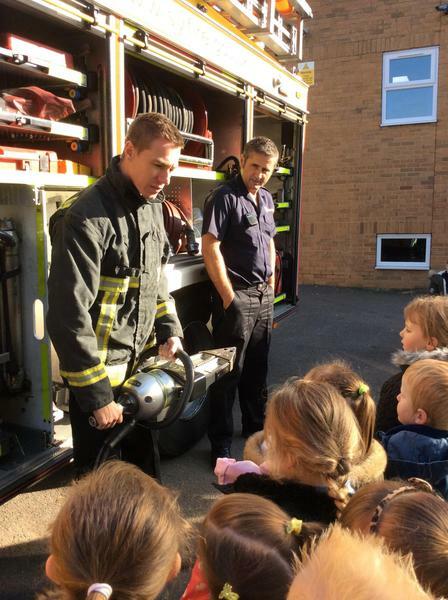 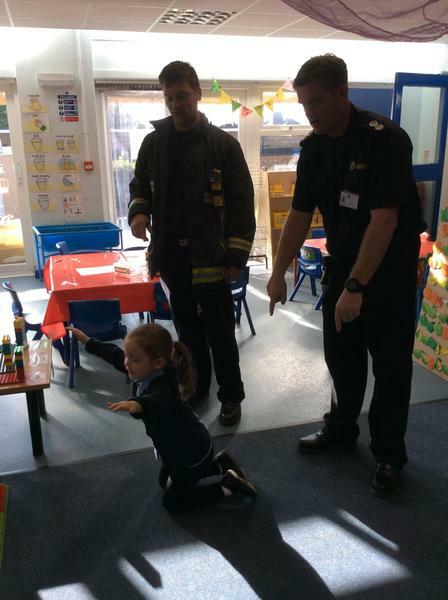 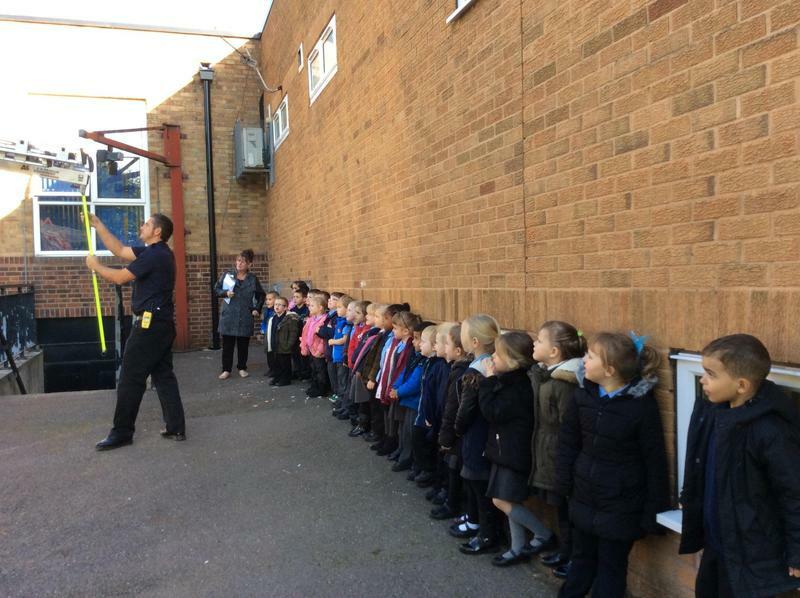 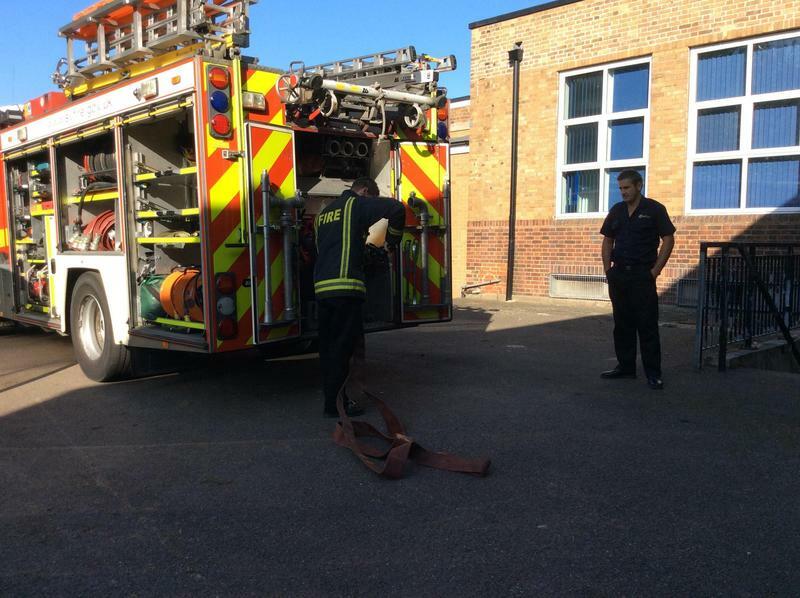 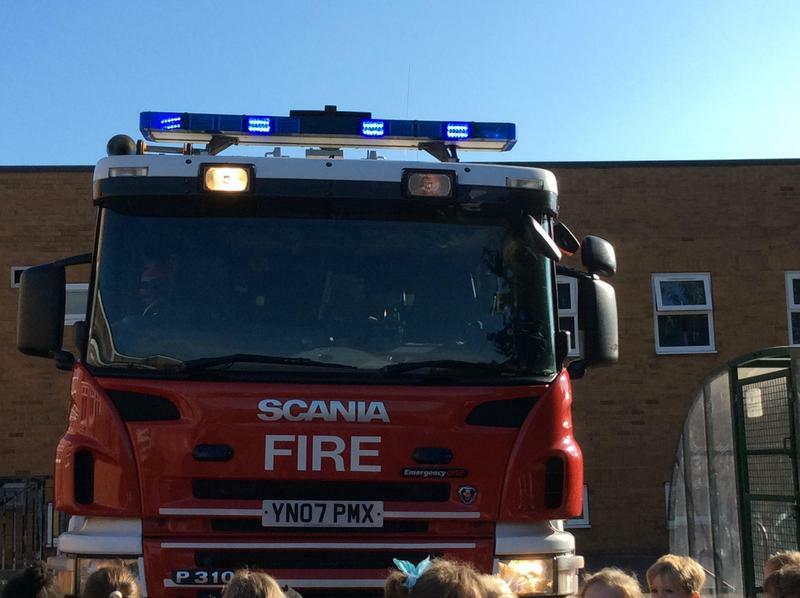 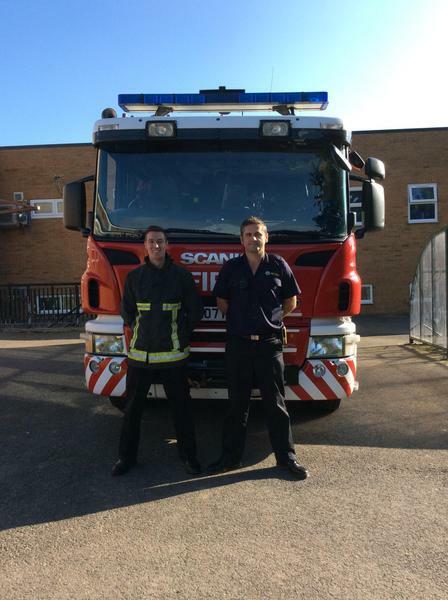 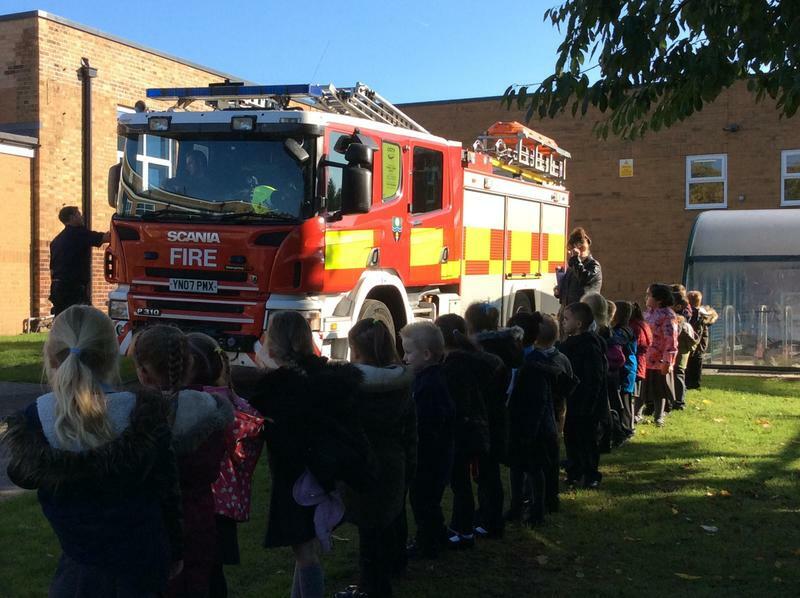 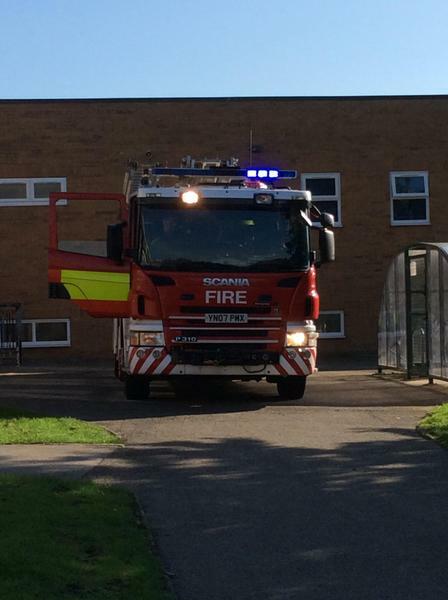 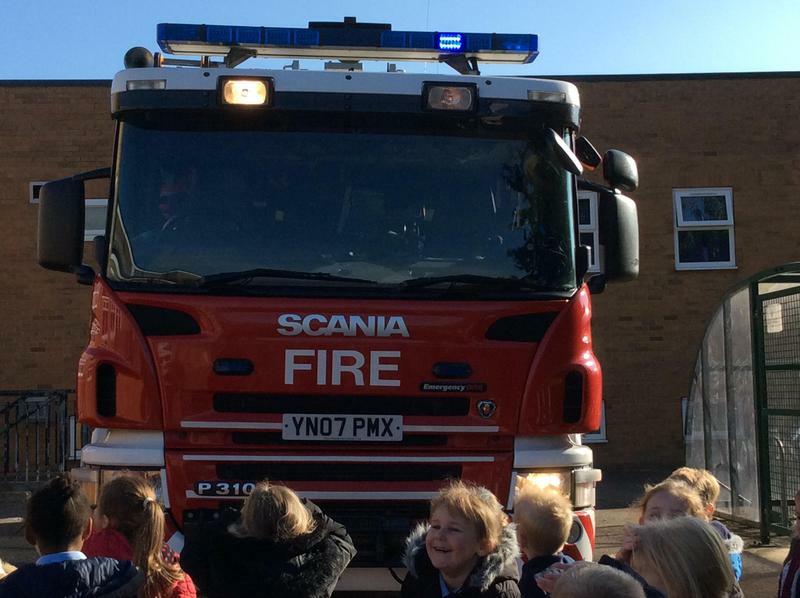 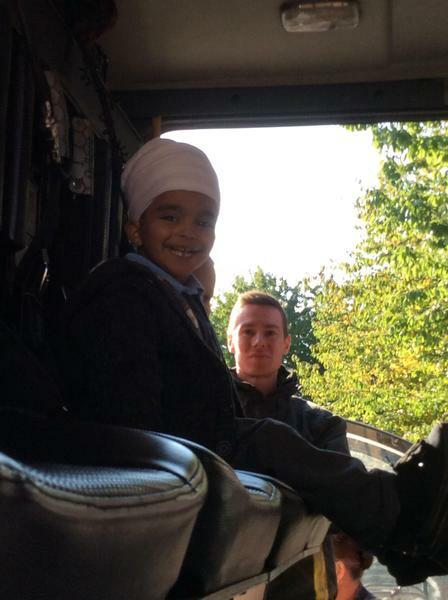 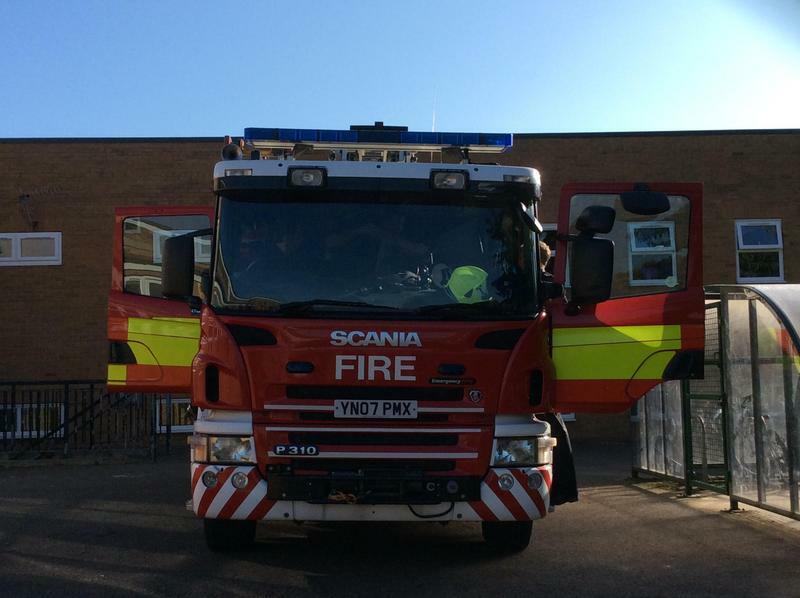 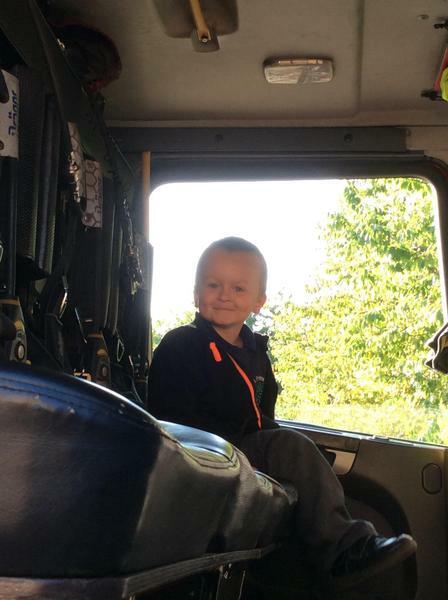 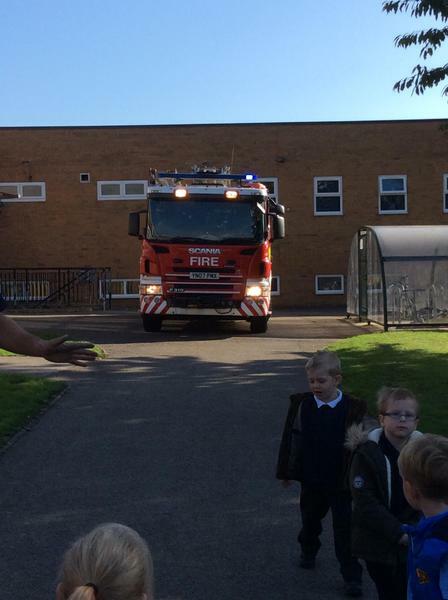 The firemen came into school and gave the children a tour of the fire engine. 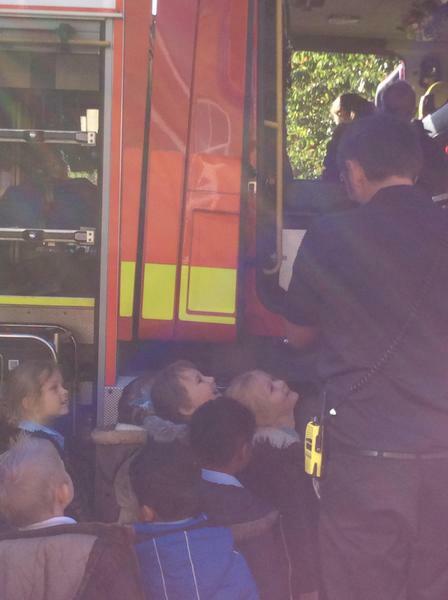 The children sat inside the cab and blocked their ears when the siren went off!! 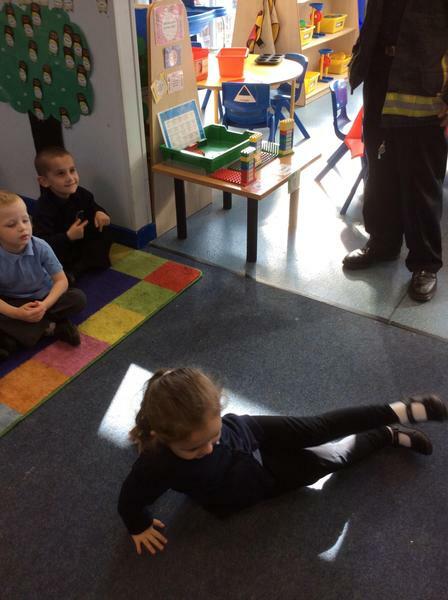 In the classroom the firemen gave a talk to the children about fire safety. 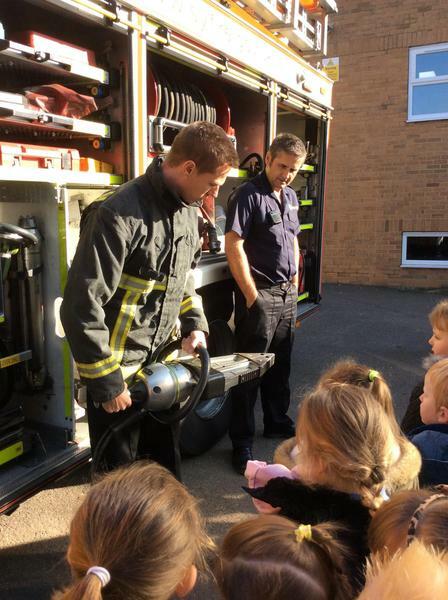 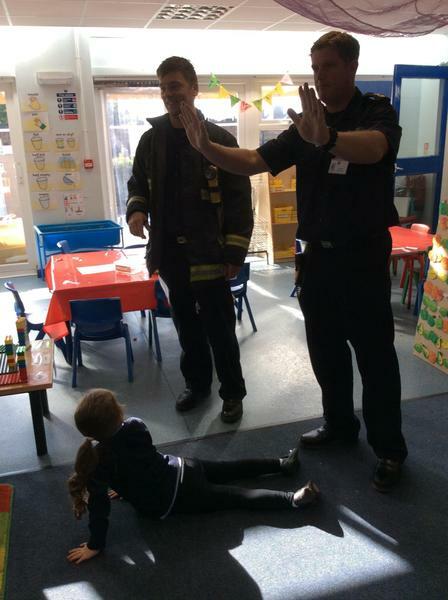 The children asked some very sensible questions and were taught that if their clothing caught alight they should, 'STOP, DROP AND ROLL'! 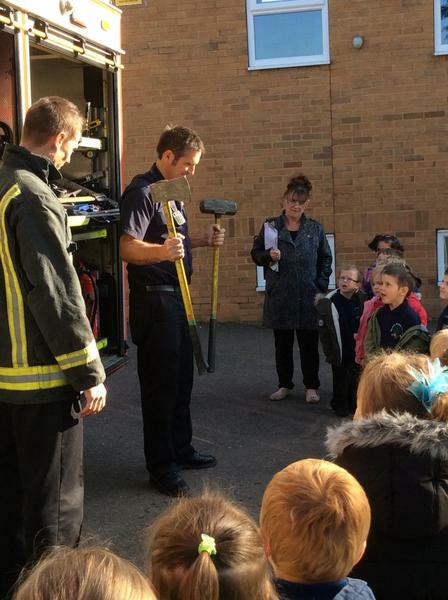 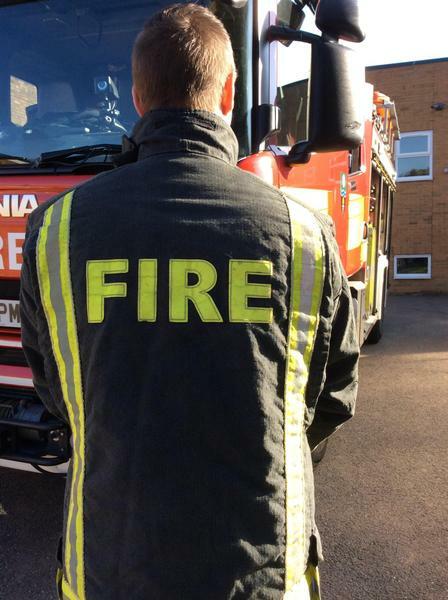 They should all be able to tell you which telephone number they should use if there is an emergency! 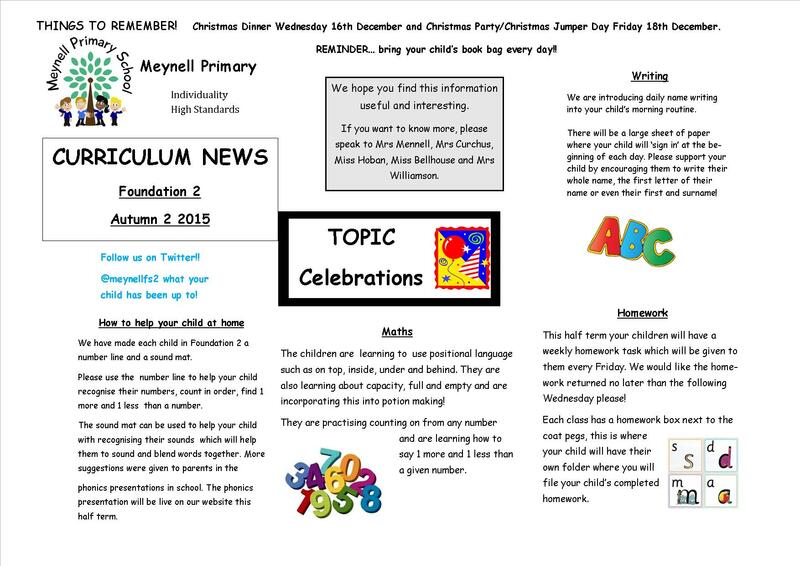 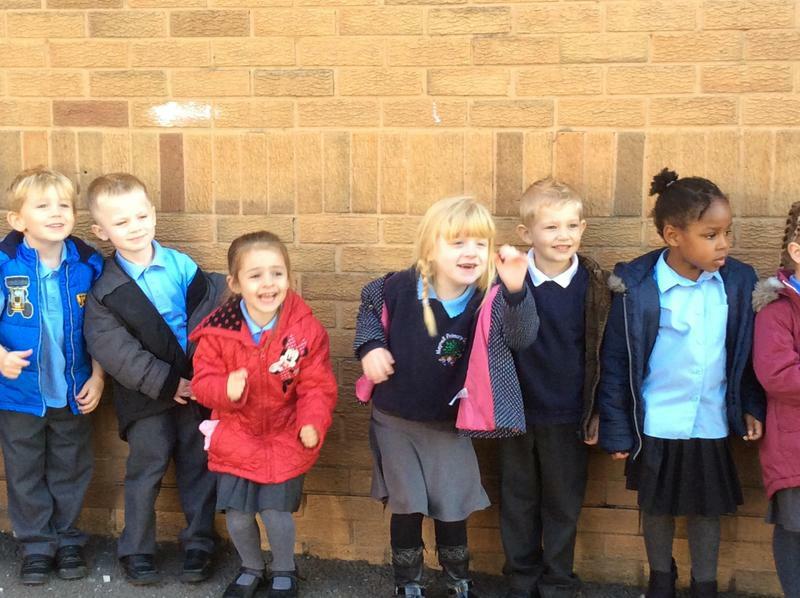 A really big welcome to all our Foundation 2 children, we hope you have a fantastic year with us and enjoy every minute. 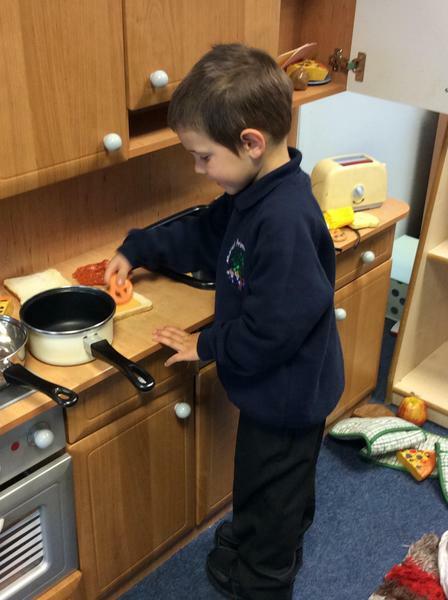 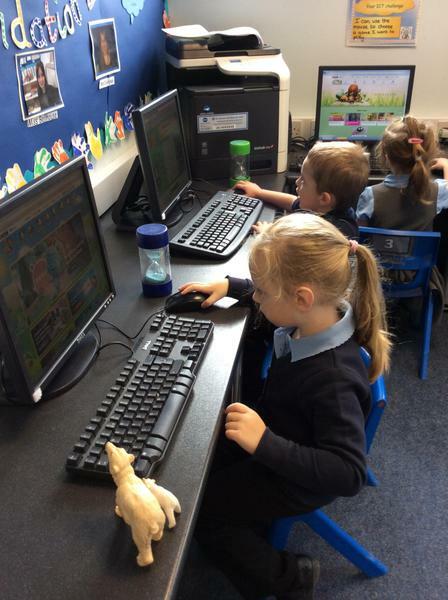 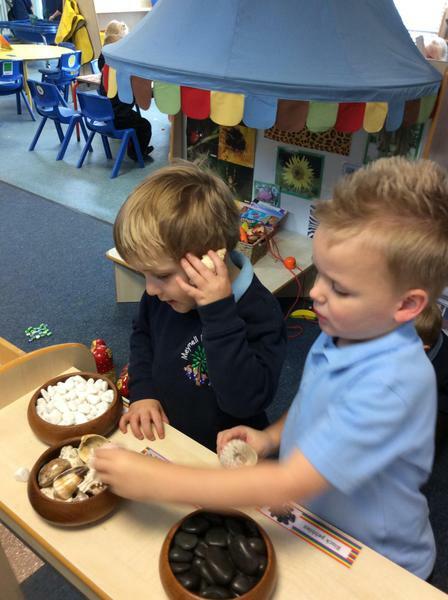 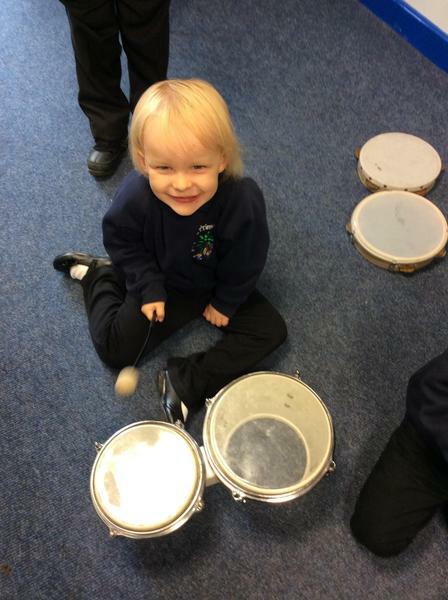 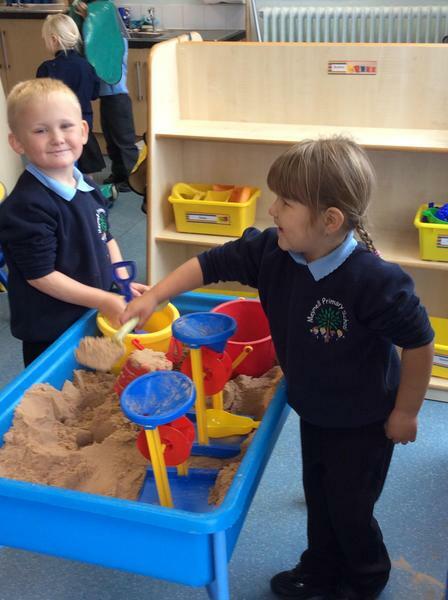 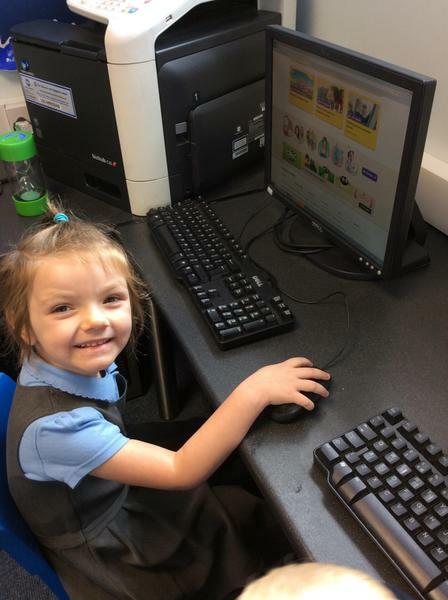 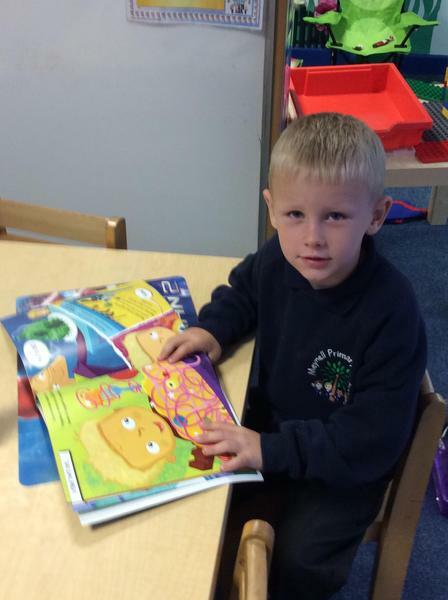 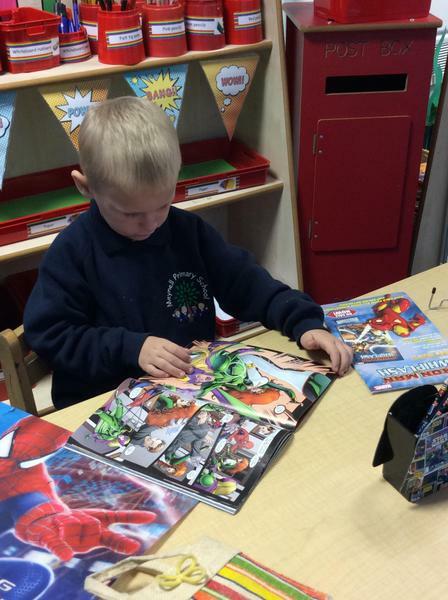 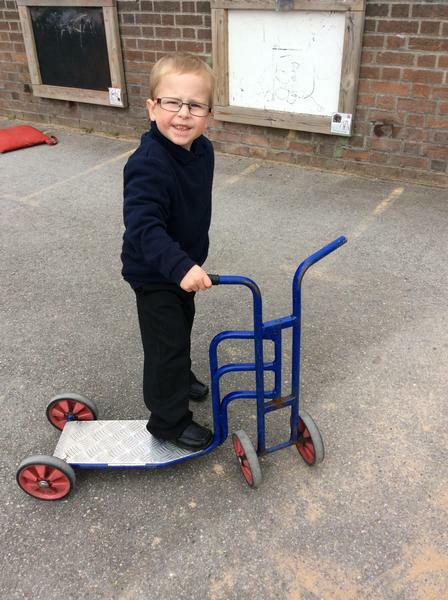 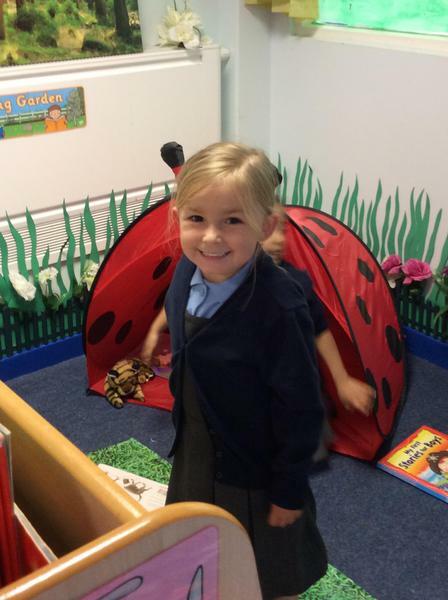 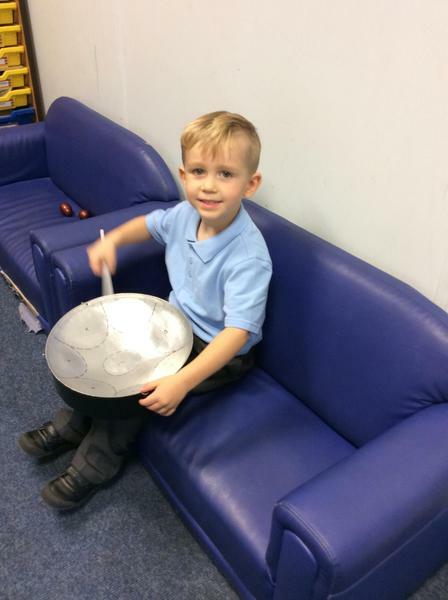 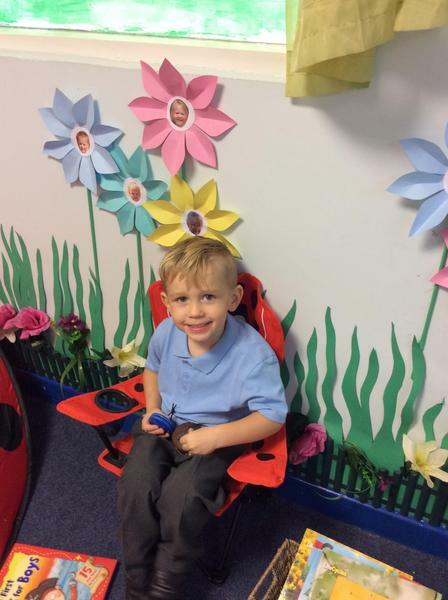 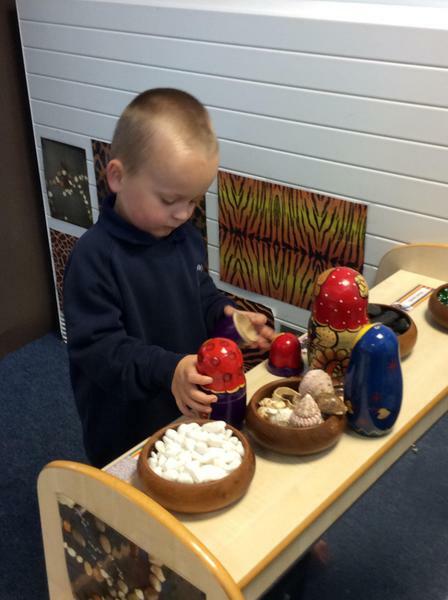 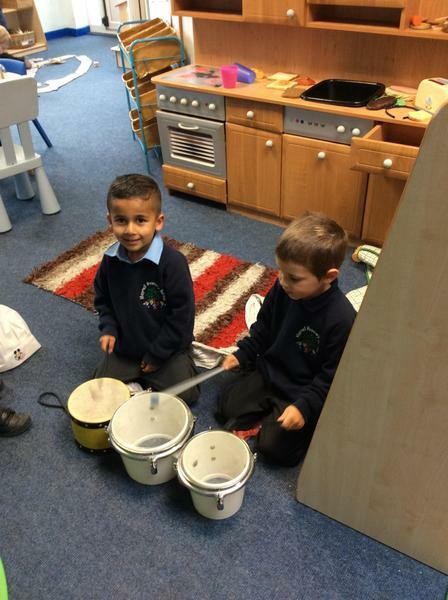 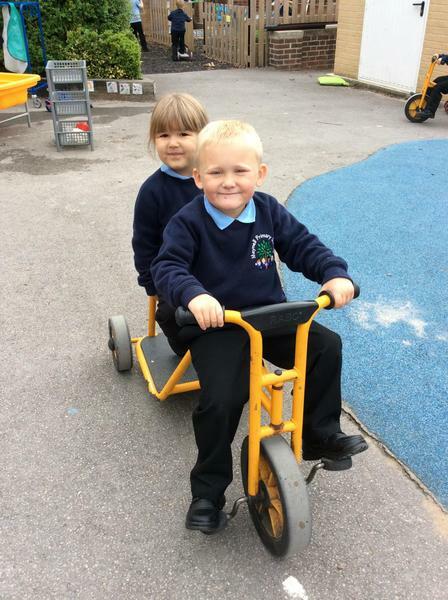 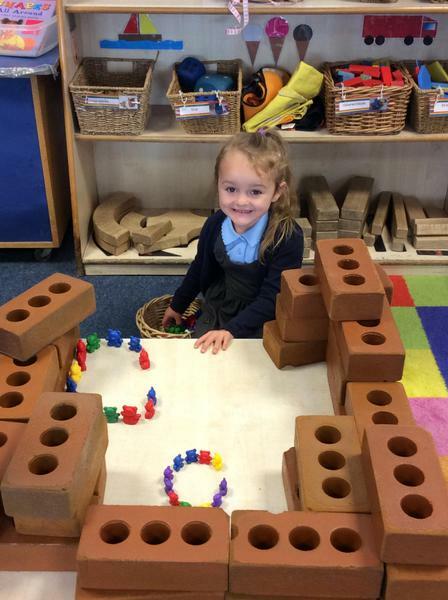 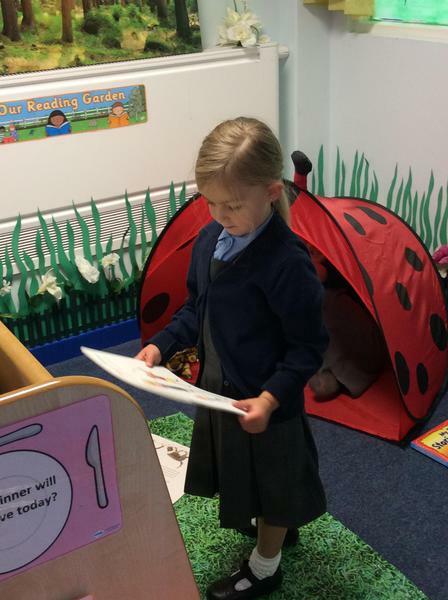 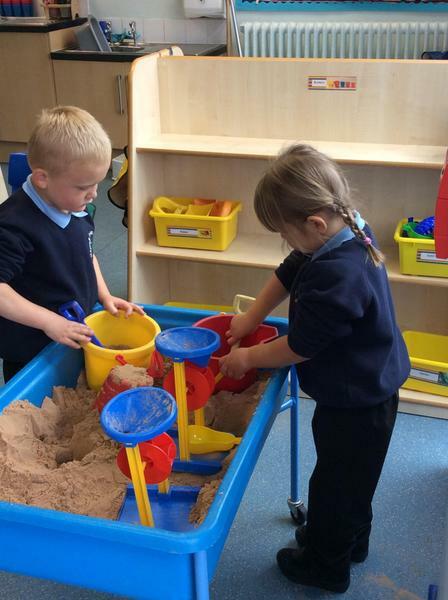 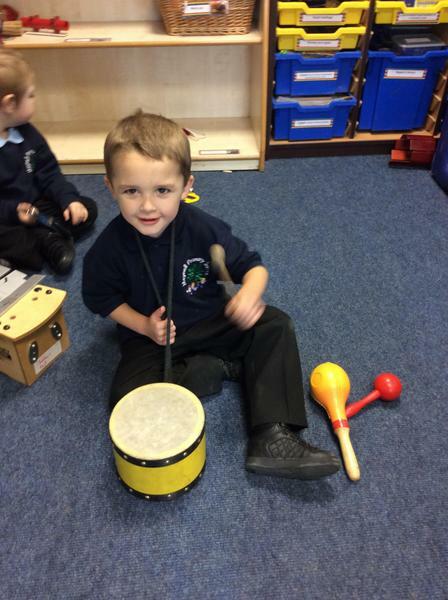 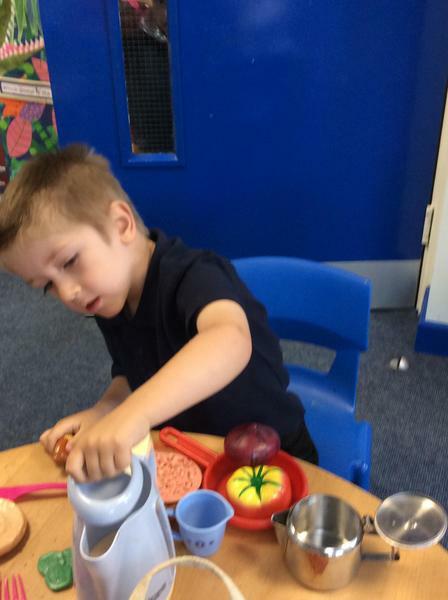 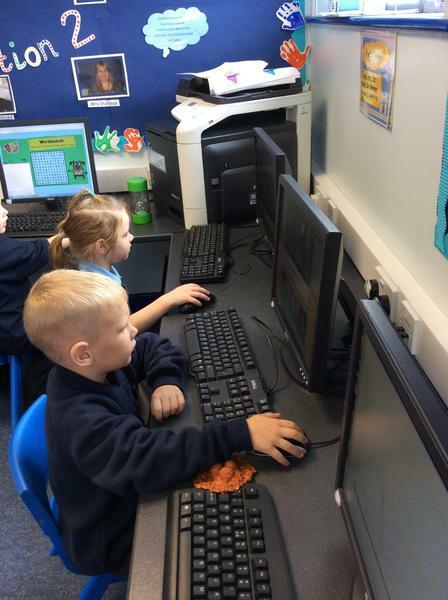 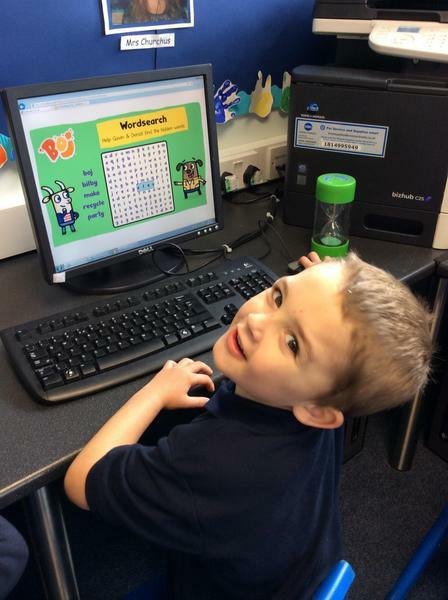 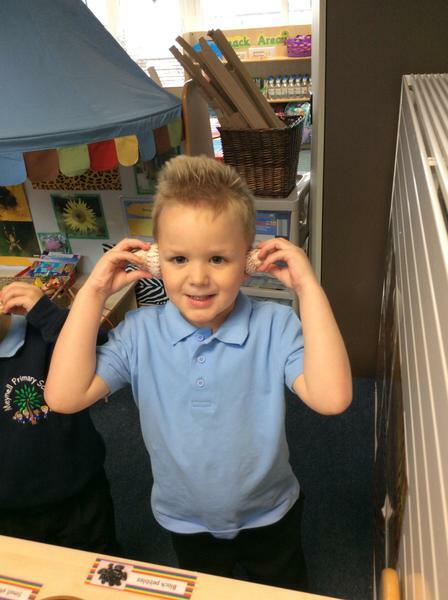 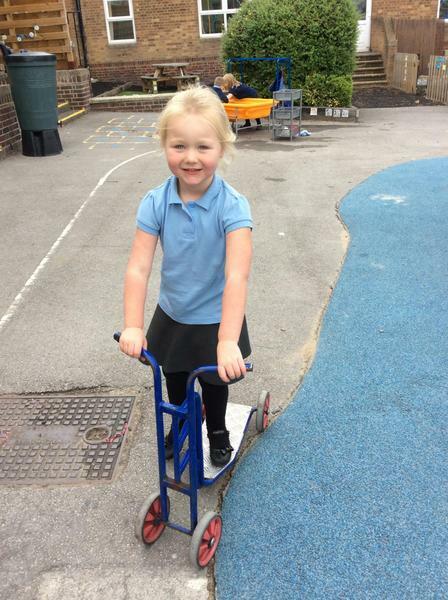 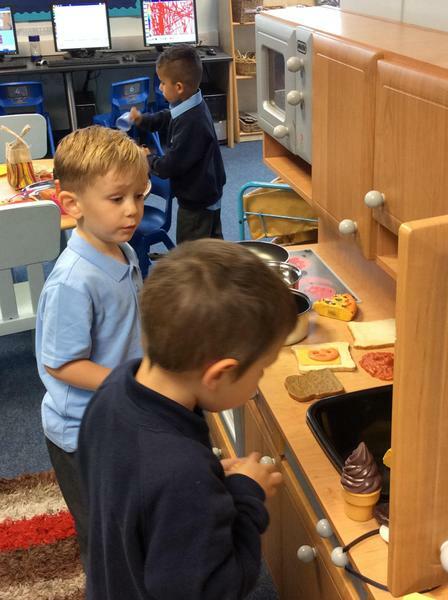 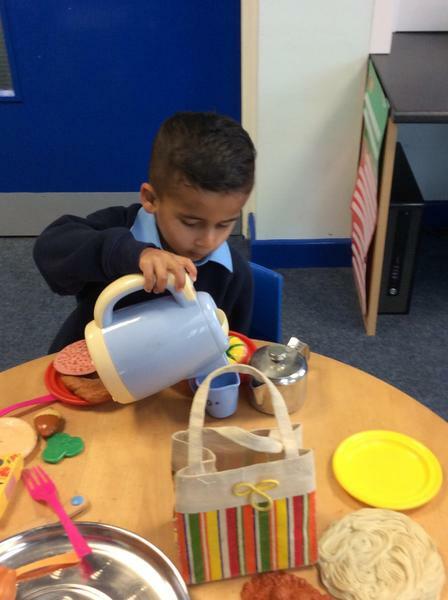 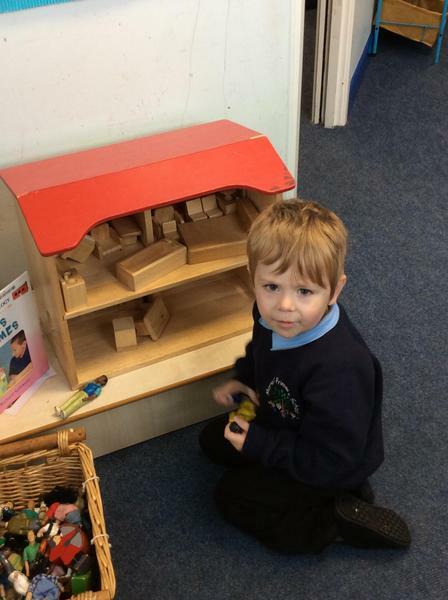 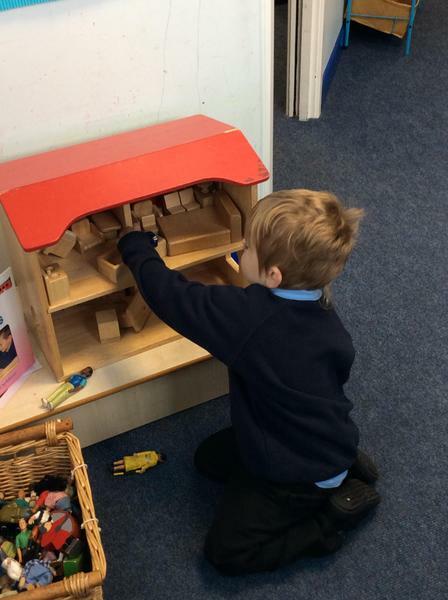 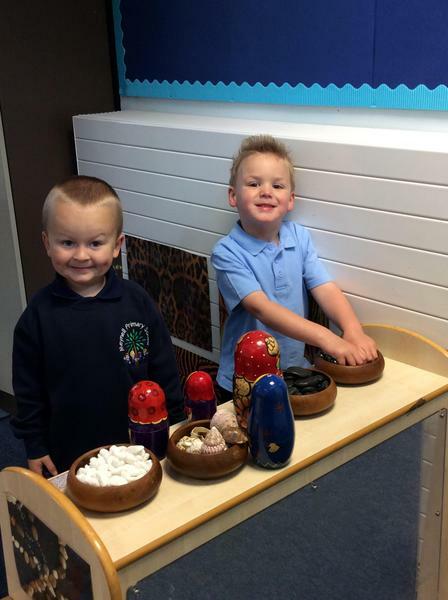 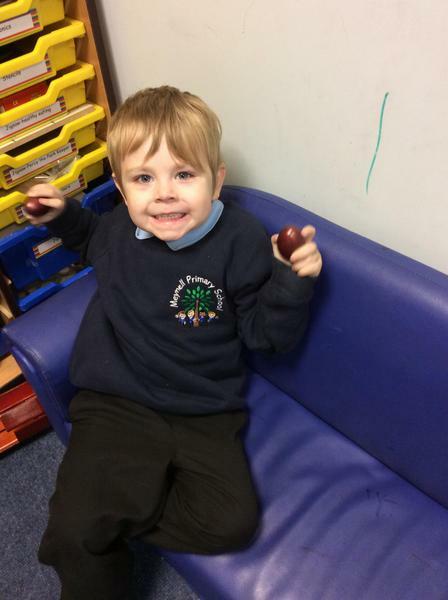 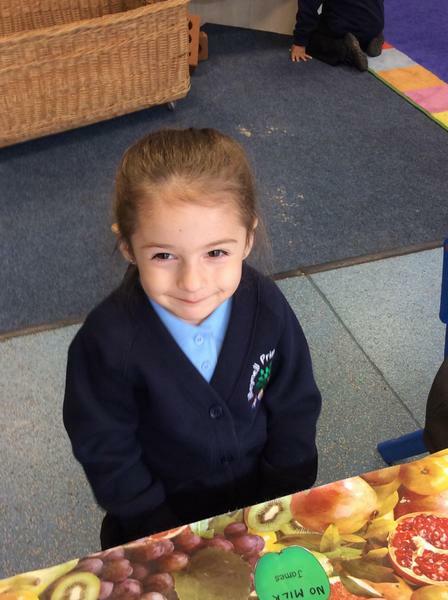 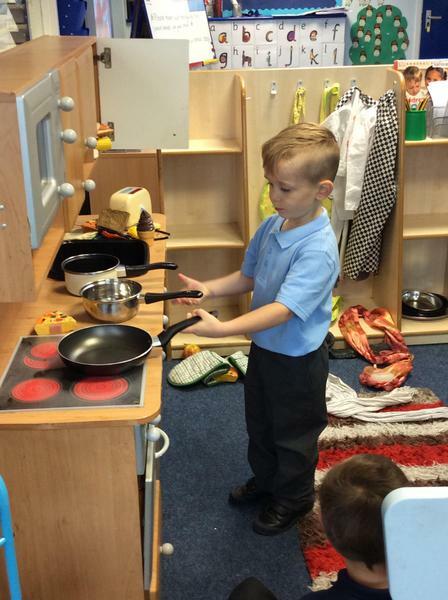 The children have had so much fun exploring their new classroom this week. 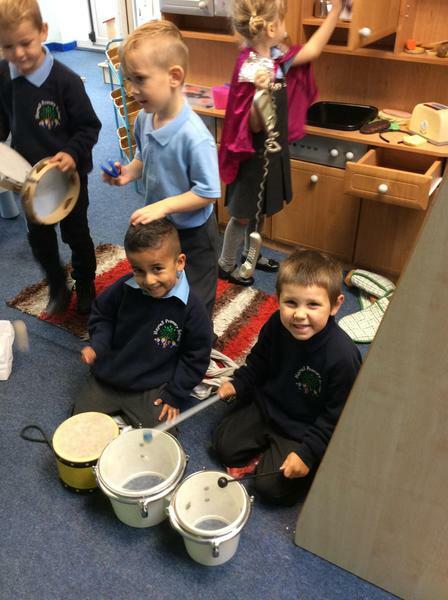 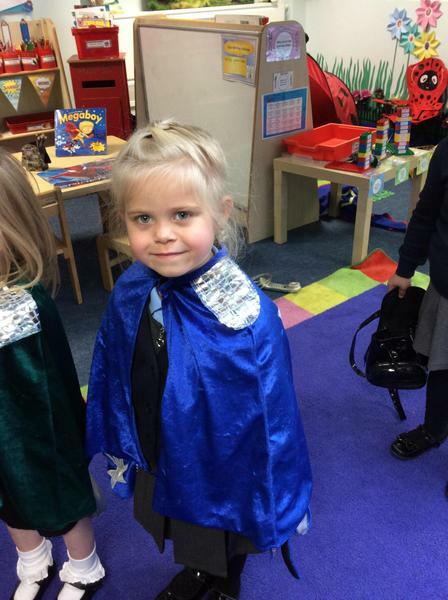 Some of the girls enjoyed dressing up as superheroes while some boys found the musical instruments and created their own band! 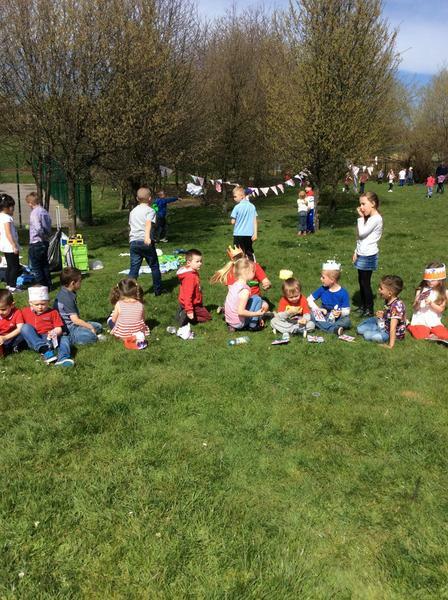 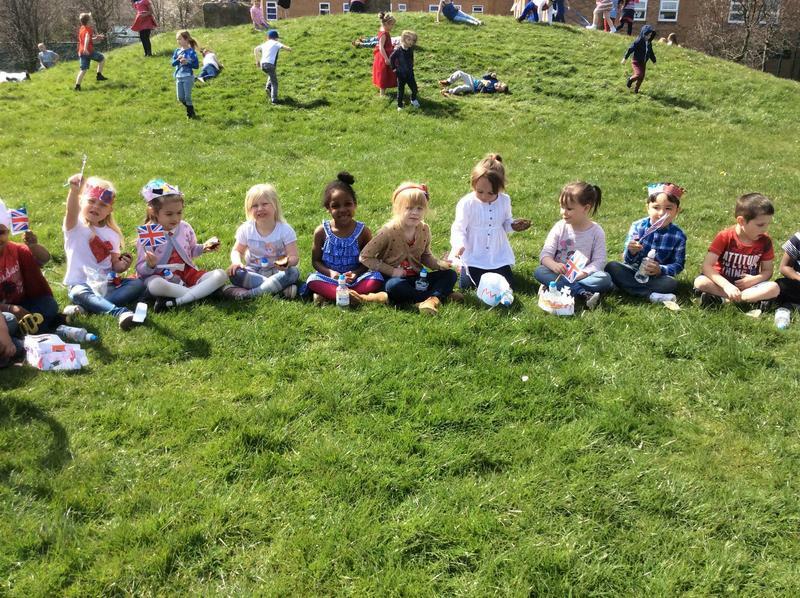 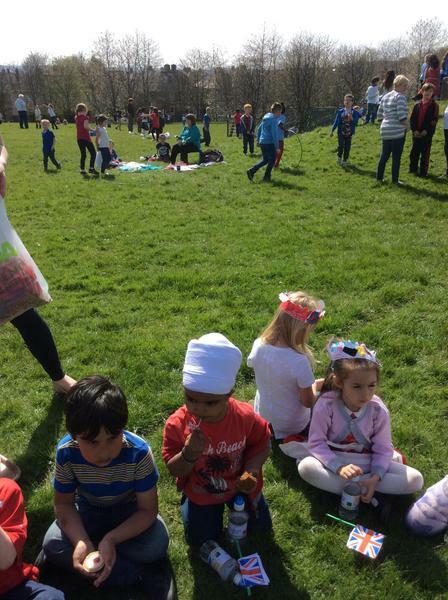 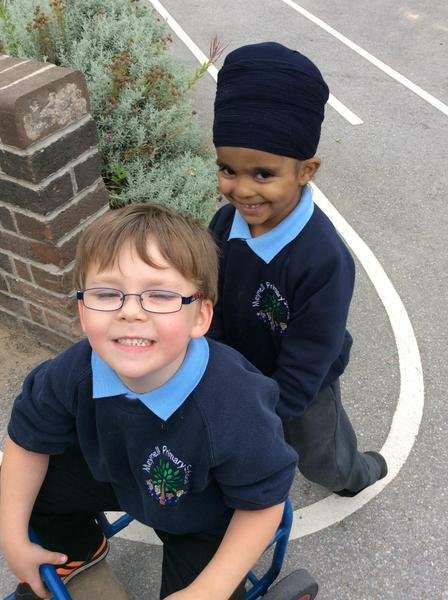 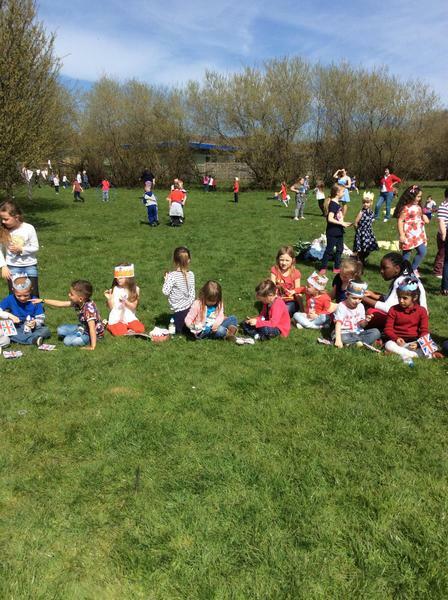 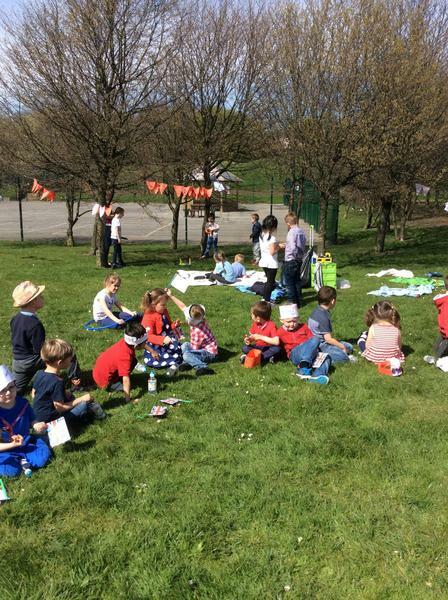 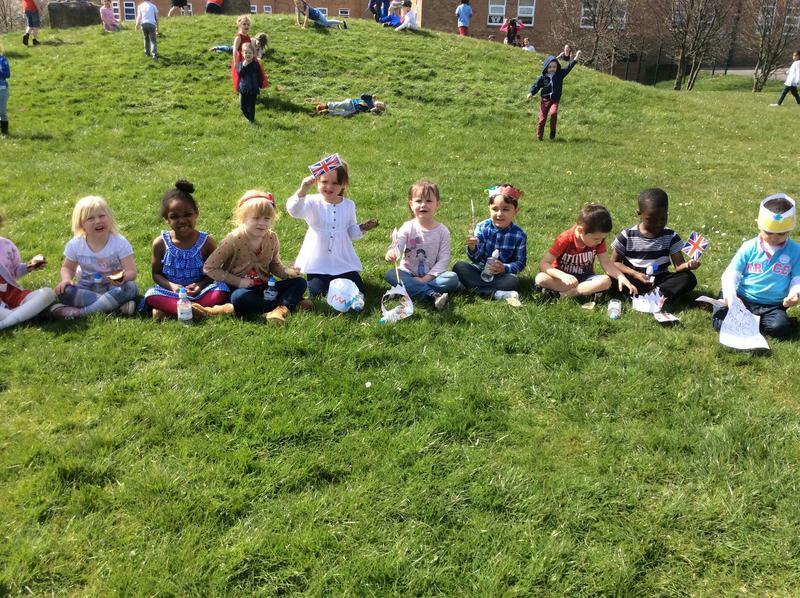 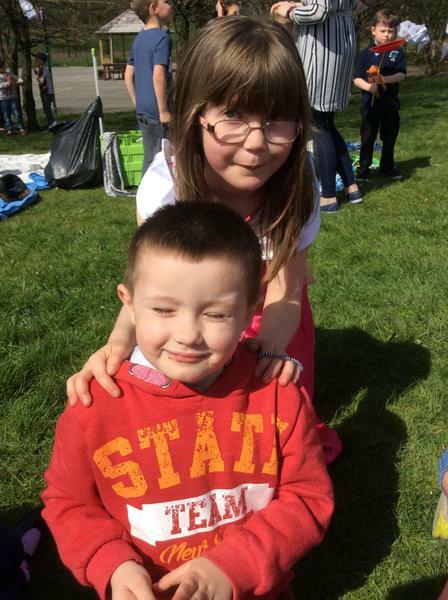 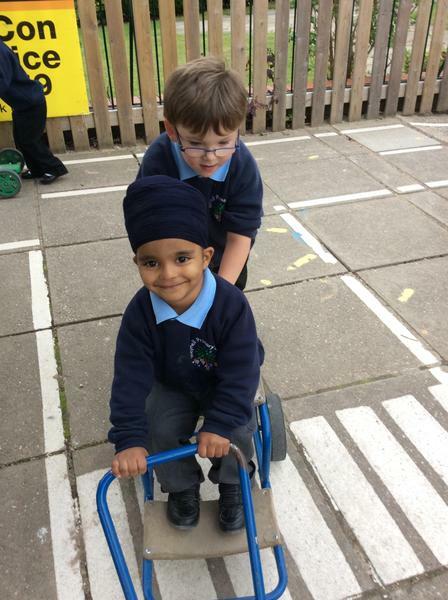 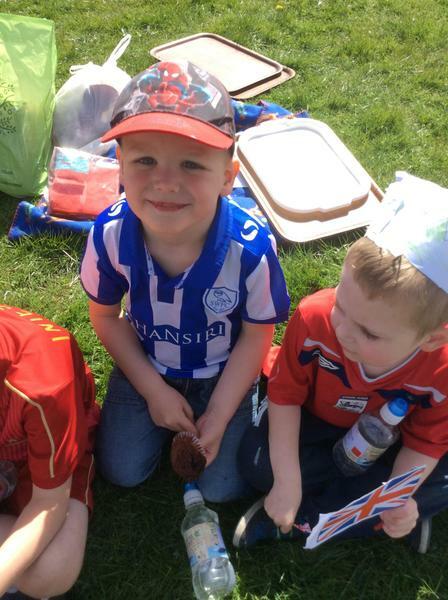 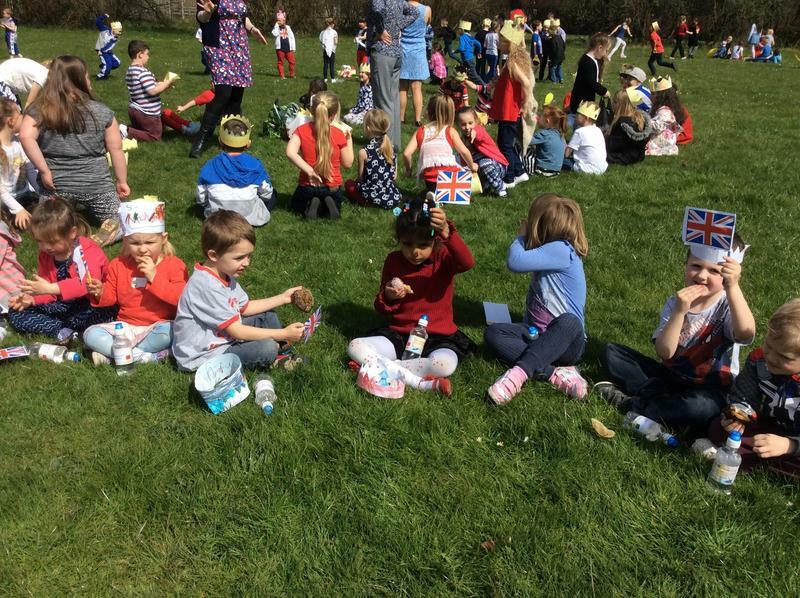 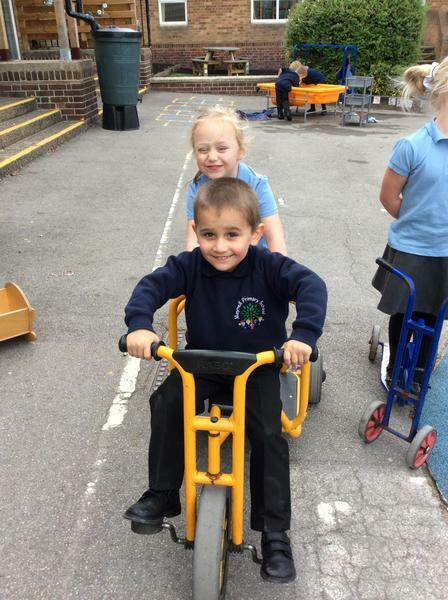 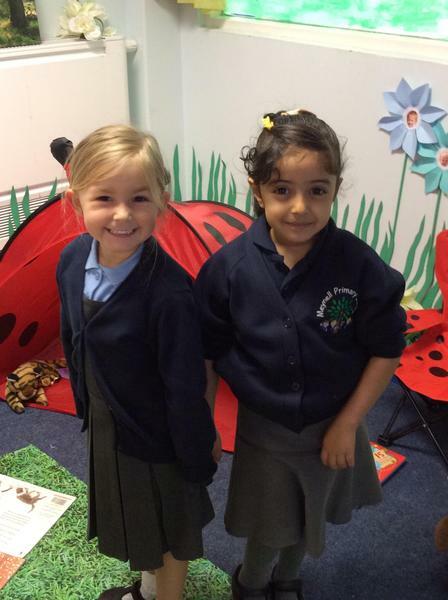 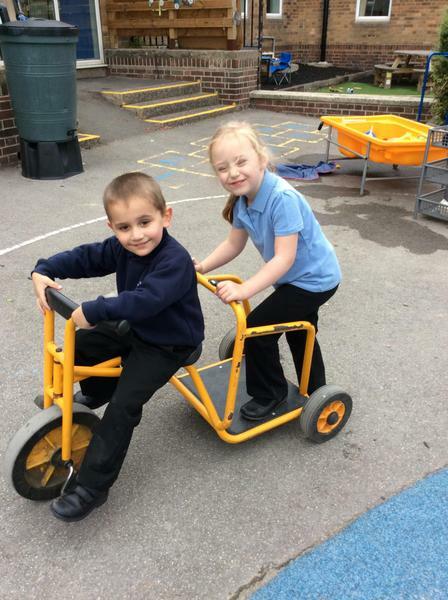 It is fantastic to see the children making so many new friends! 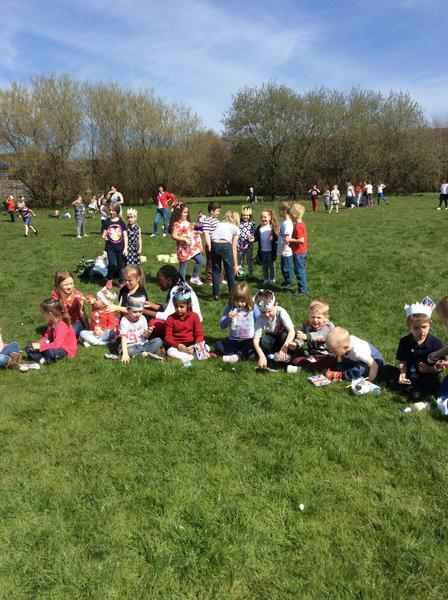 A big well done from Miss Hoban, Mrs Churchus, Mrs Mennell, Miss Bellhouse and Mrs Williamson!